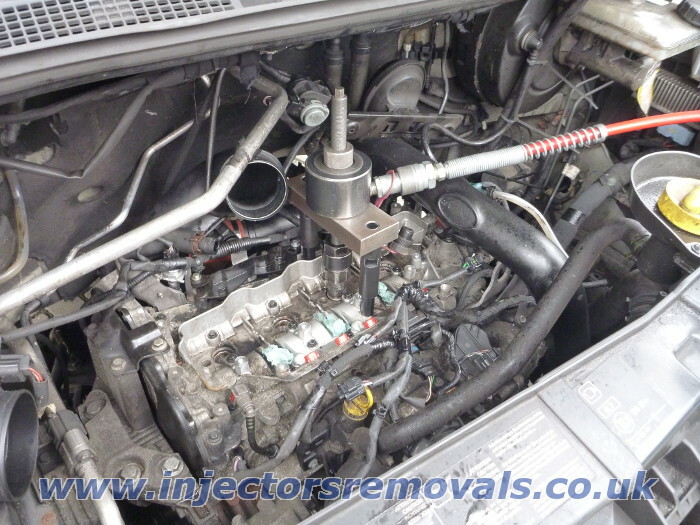 removes broken glow plugs from diesel engines. 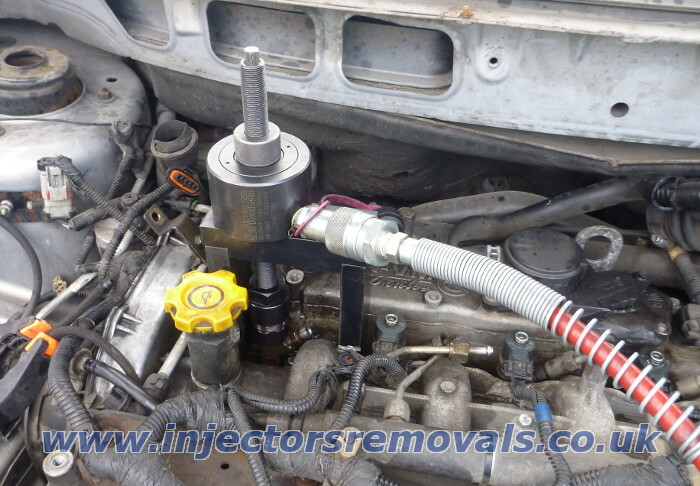 Don't you know how to remove injector? 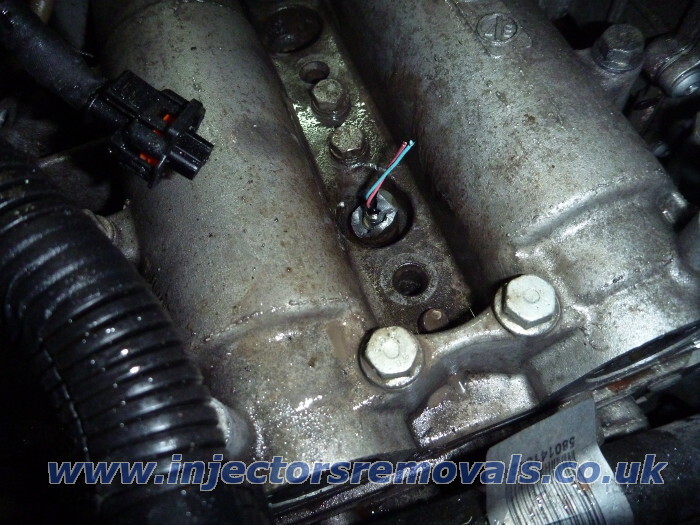 Can't you move it? 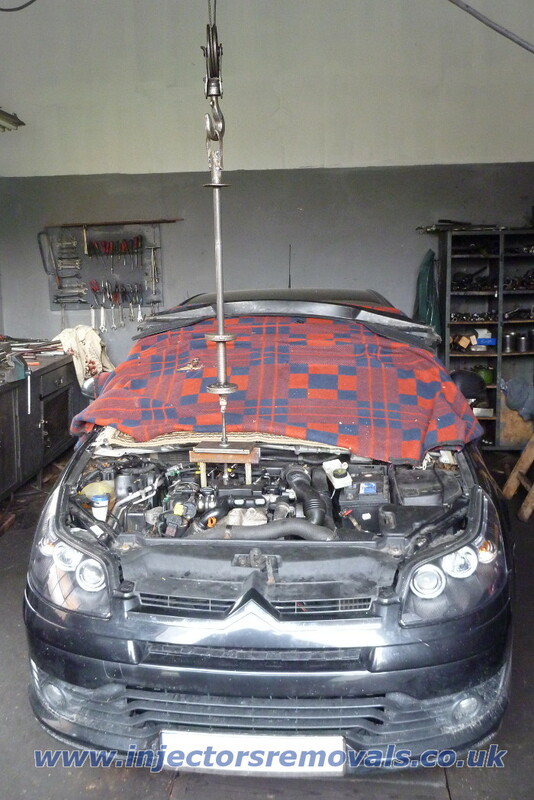 Did you try to move it in different ways? 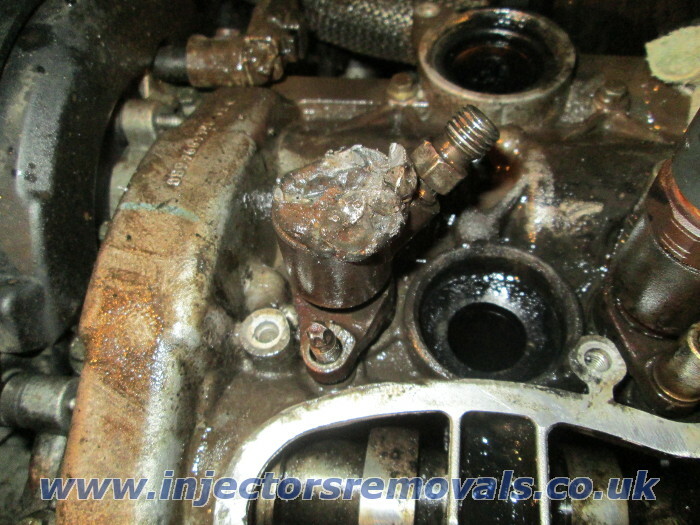 Nothing didn't resolve your injector problem? 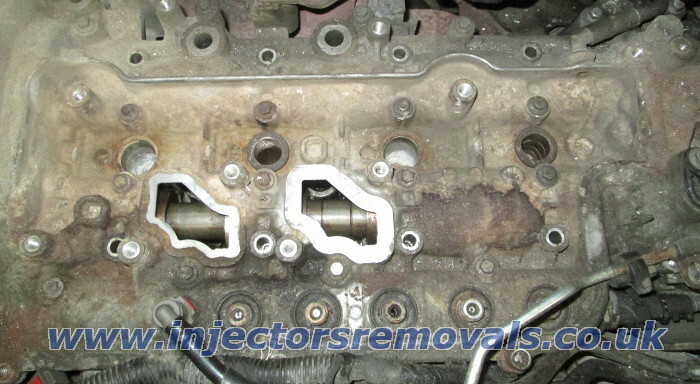 than we remove it as a whole part. 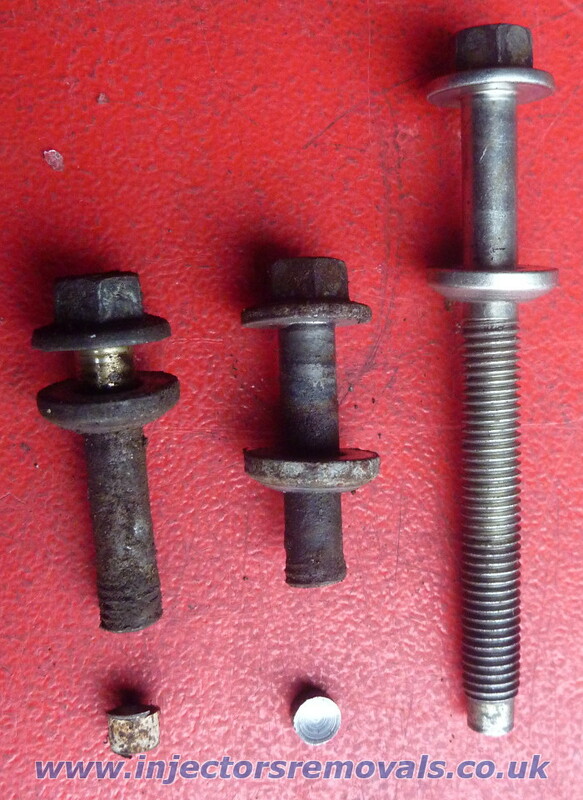 Don't waste your time hitting with a hammer because you will only get tired and waste time. 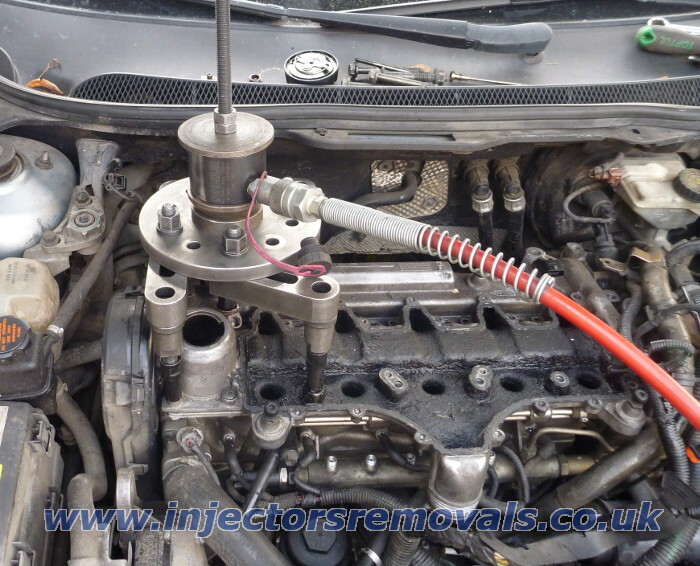 without removing head or engine outside your car / van. 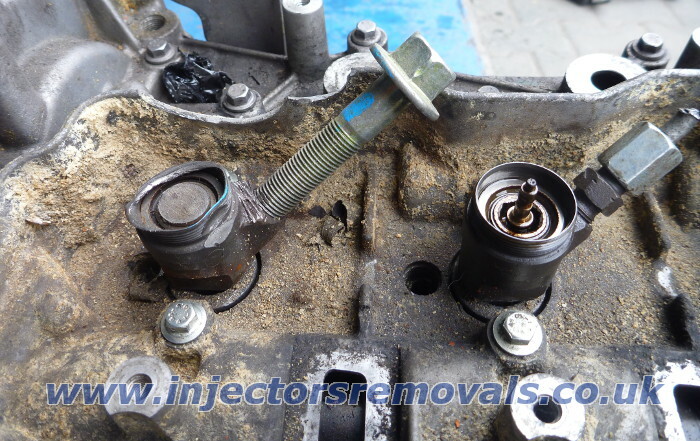 it pulls injectors using top thread only. 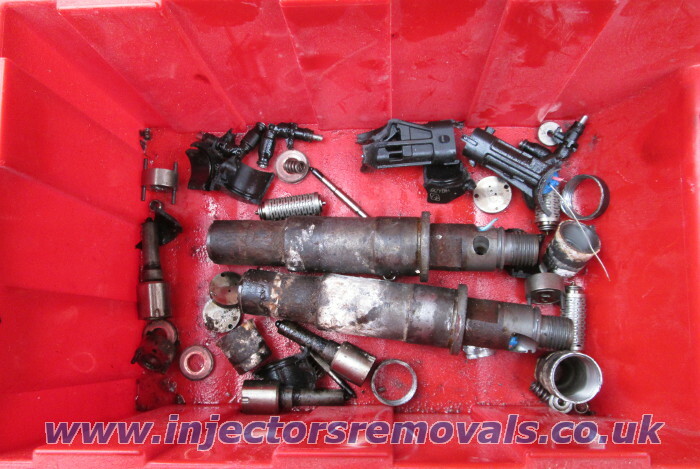 from the top what makes removal much more difficult. 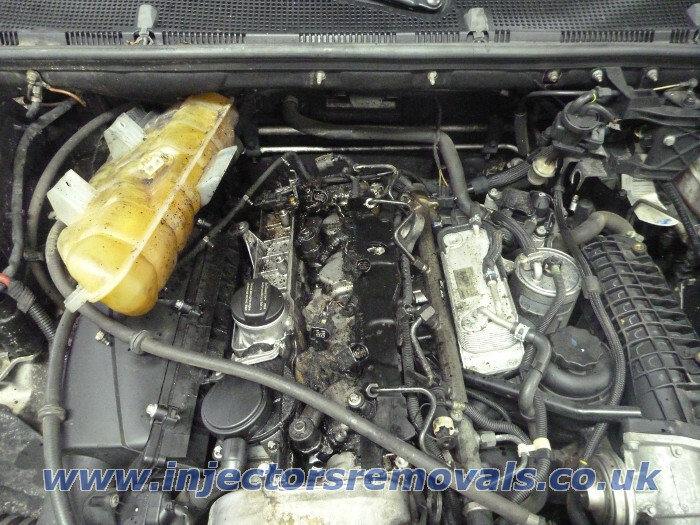 Frozing, heating, flooding or hitting give no results. 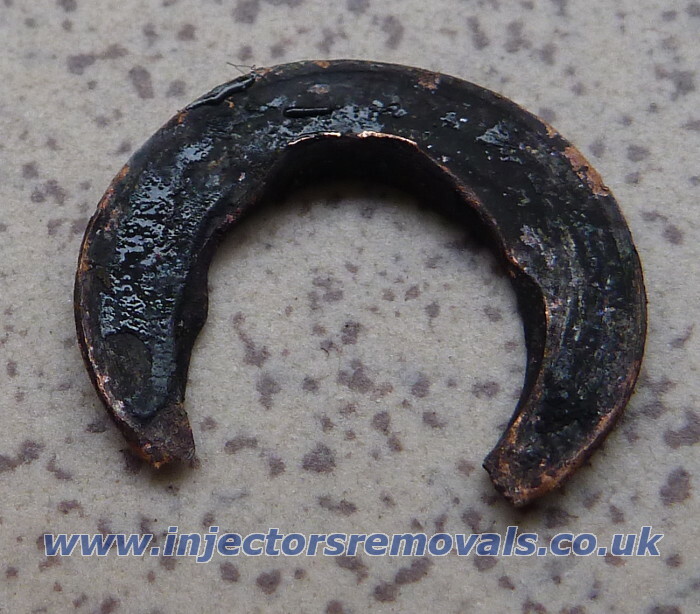 Welding doesn't have sense because welds will snap as well and make removal much more difficult . 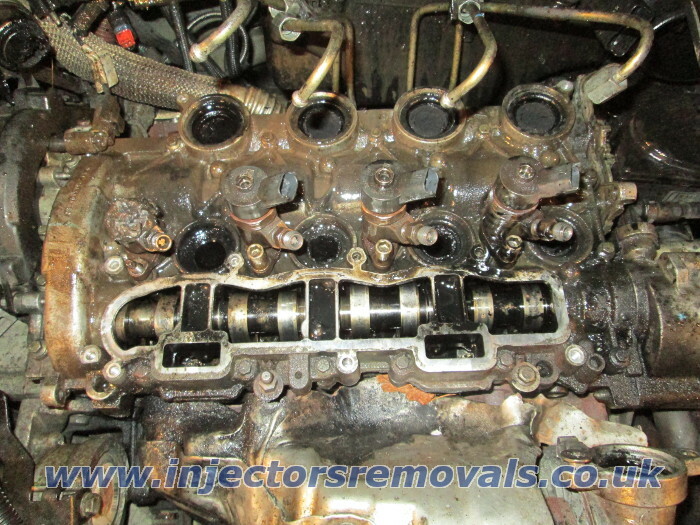 In such a situation we had to remove broken injector for 12-13 hours of hard work. 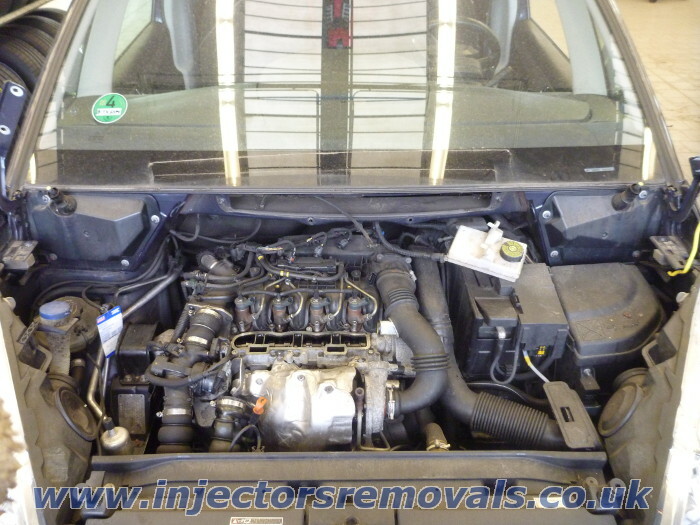 we had to remove it in many parts was in some Multicar with 8.989 km / 5.618 mls mileage only. 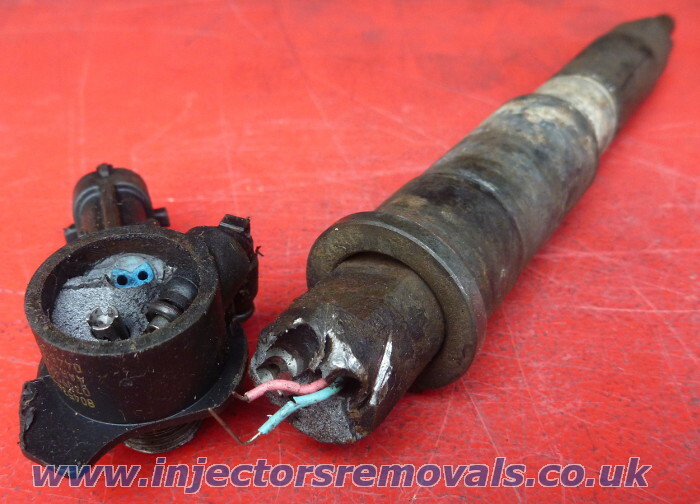 removed from a brand new van just collected from dealer. 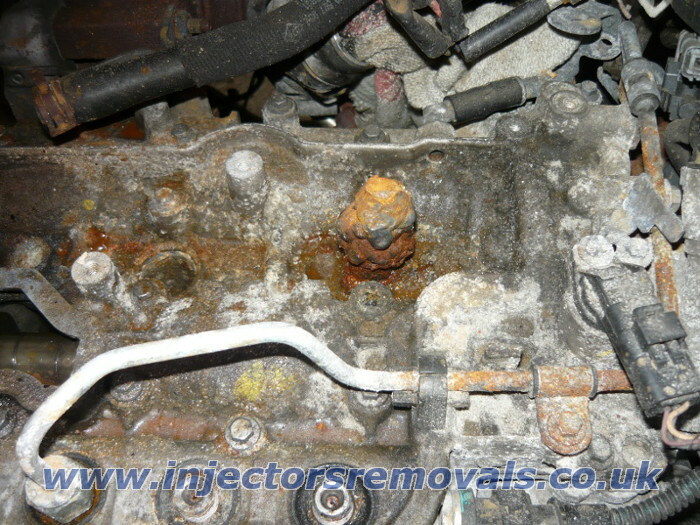 Corrosion signs can be already seen. 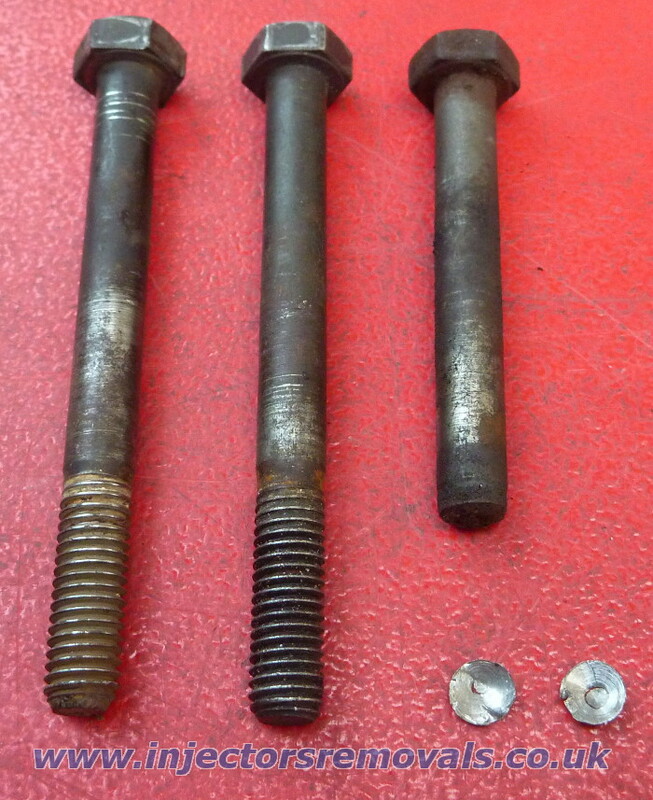 after a while from new, bolts usually snap. 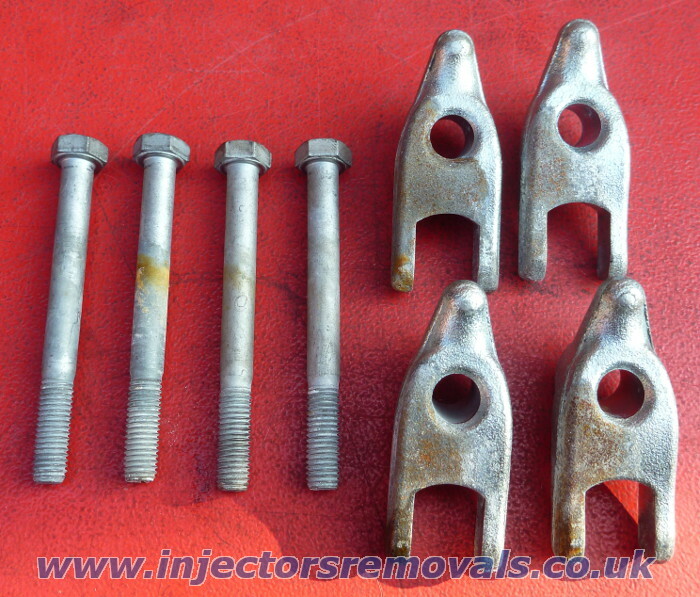 We remove broken bolts as well. 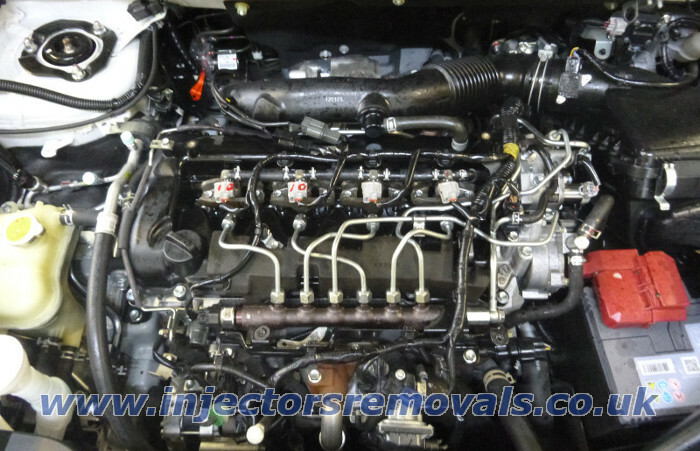 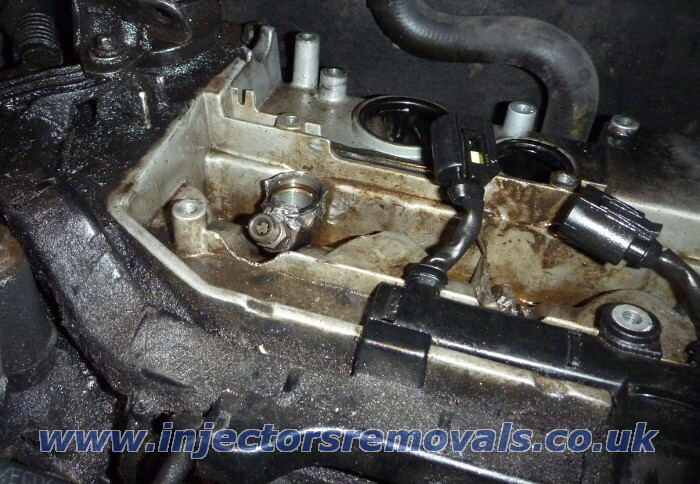 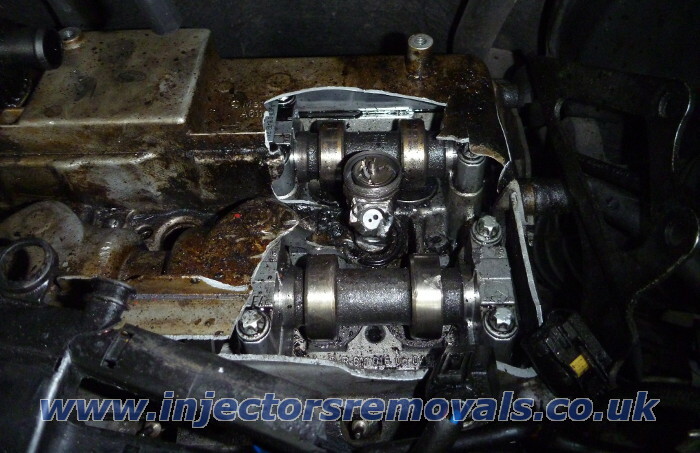 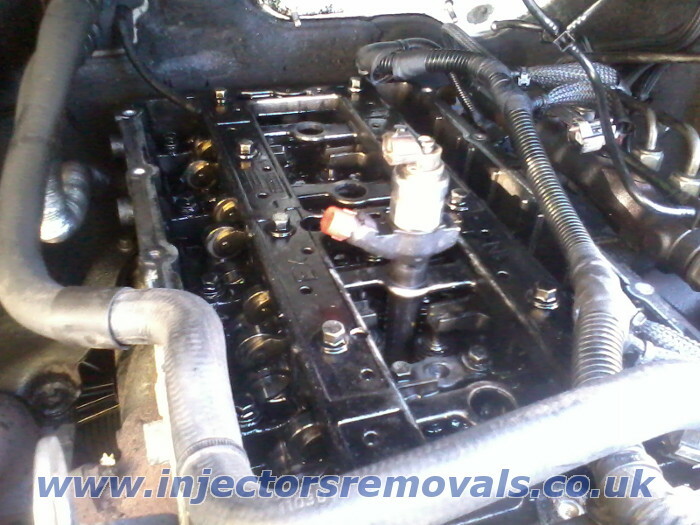 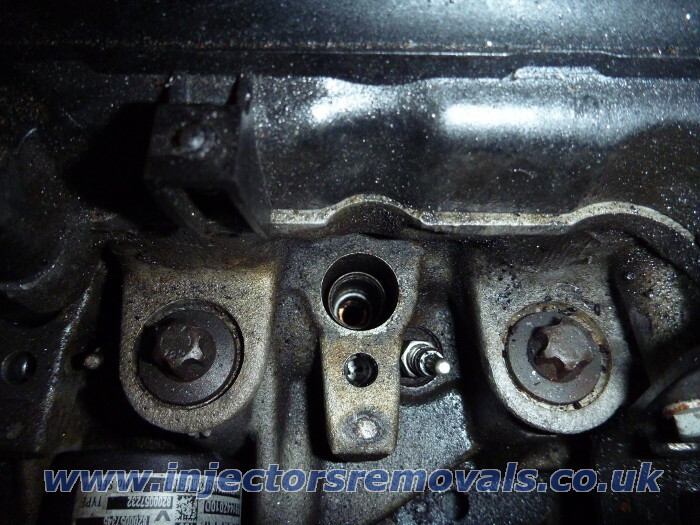 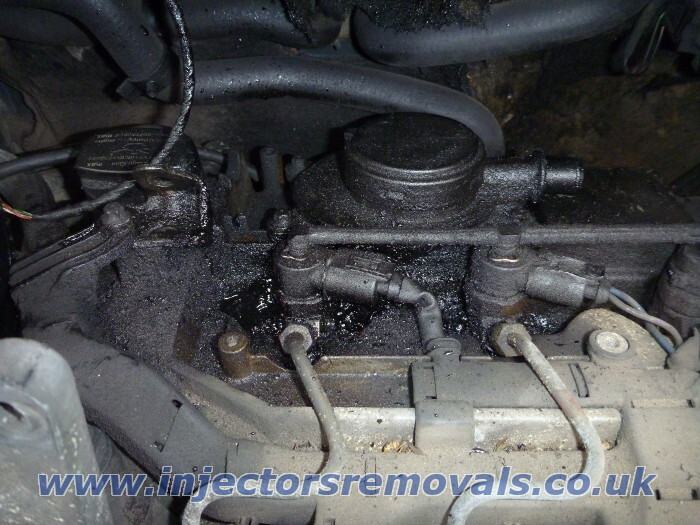 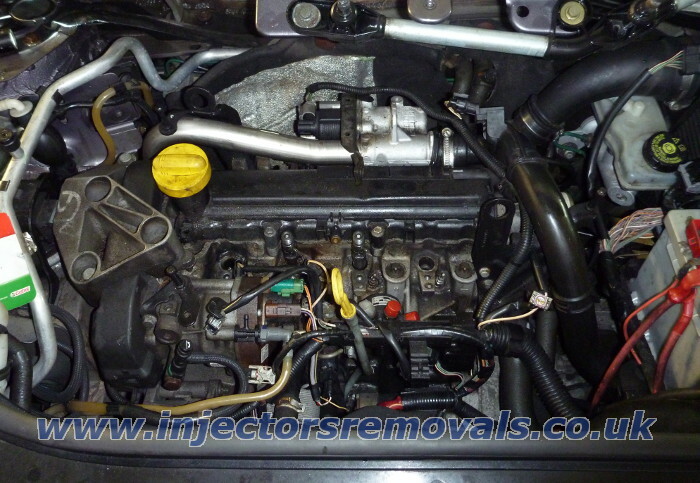 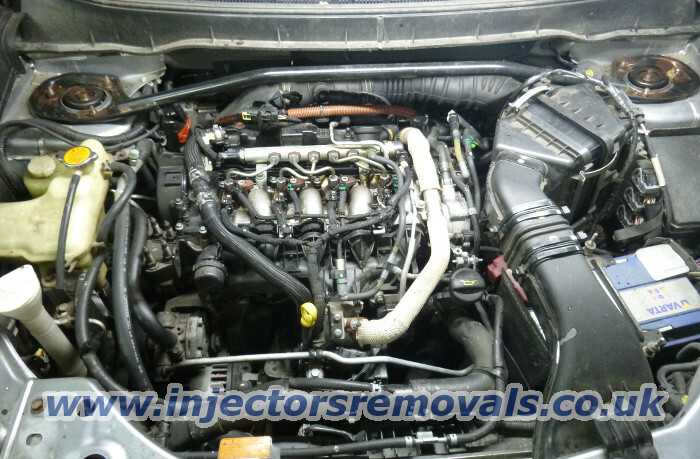 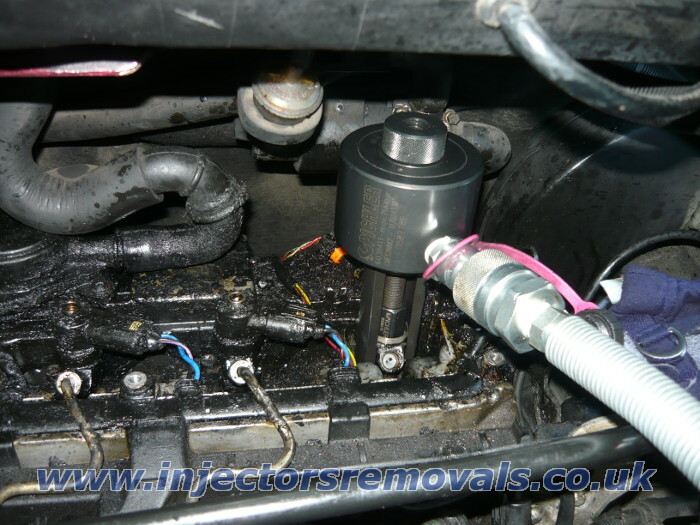 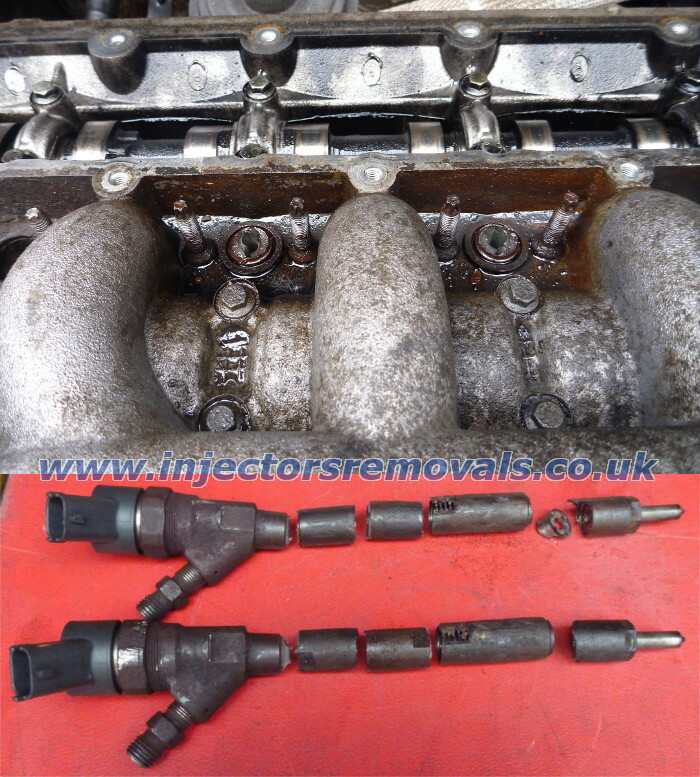 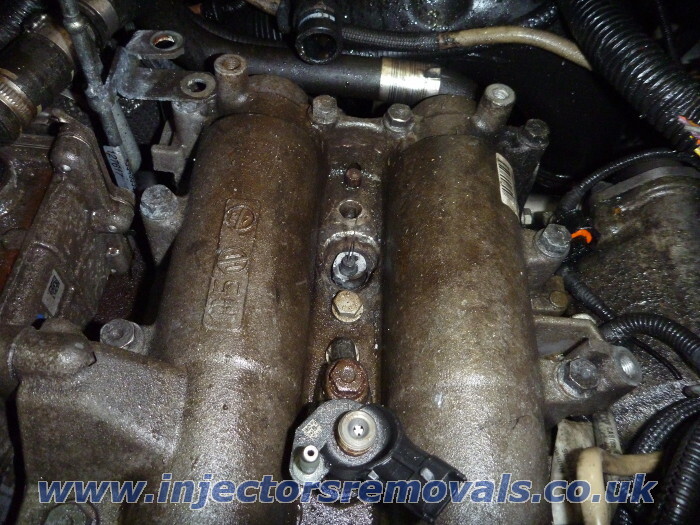 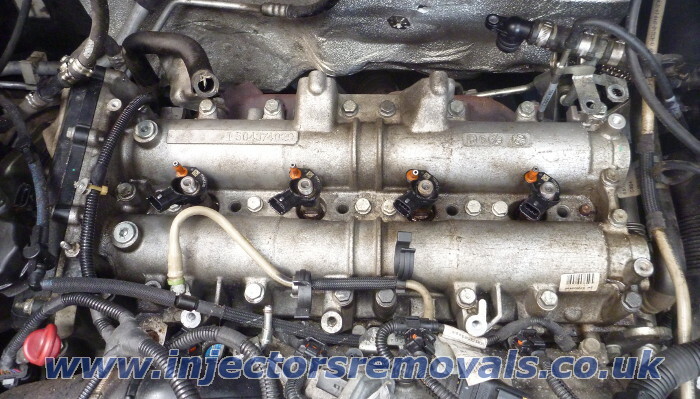 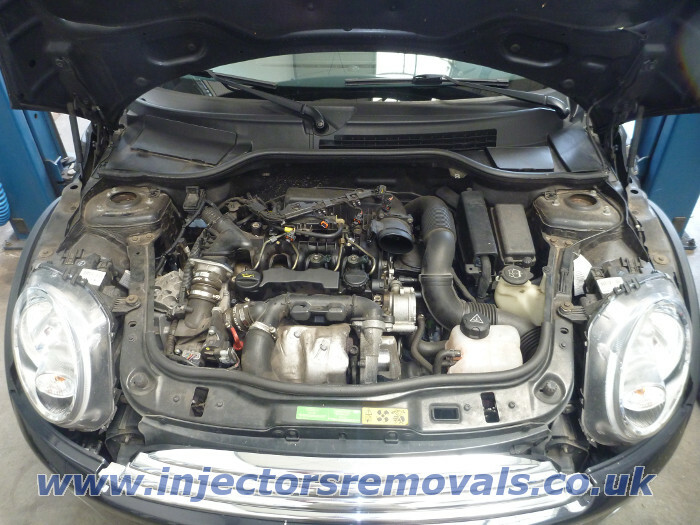 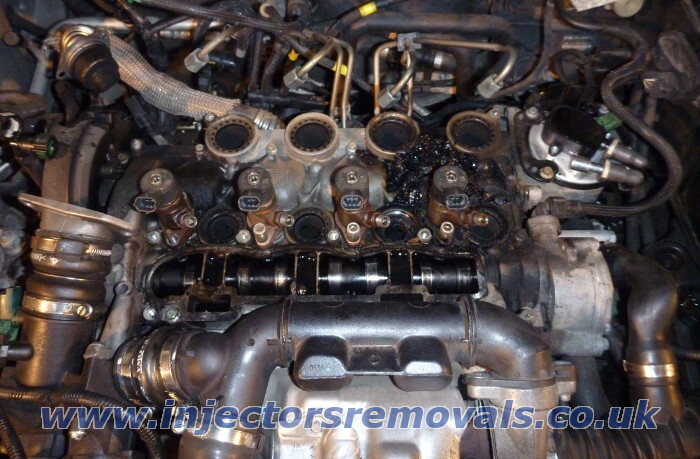 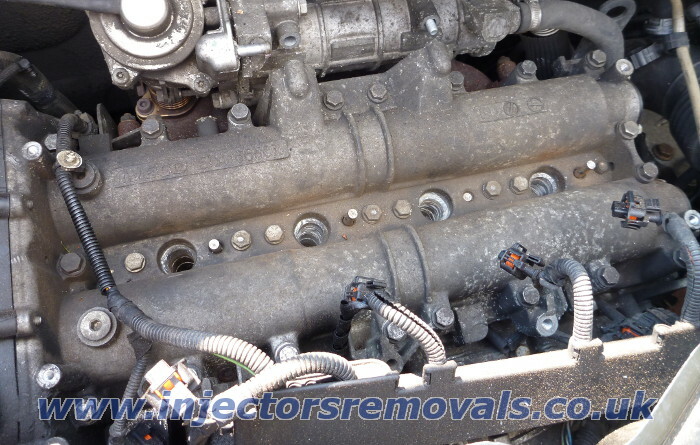 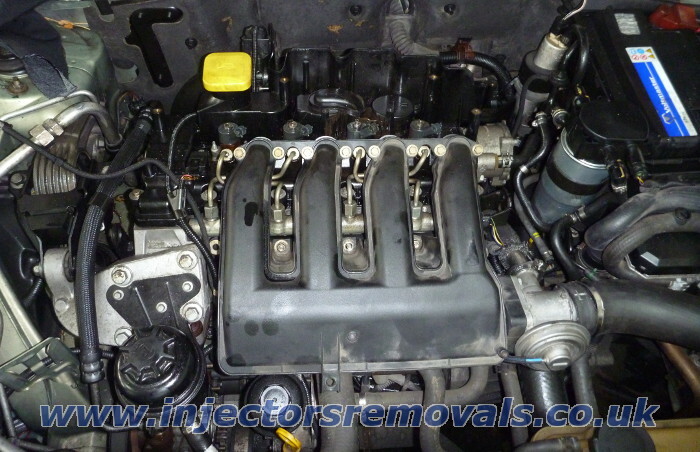 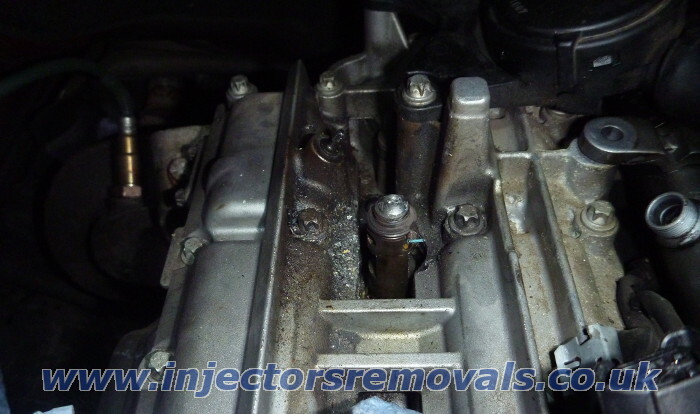 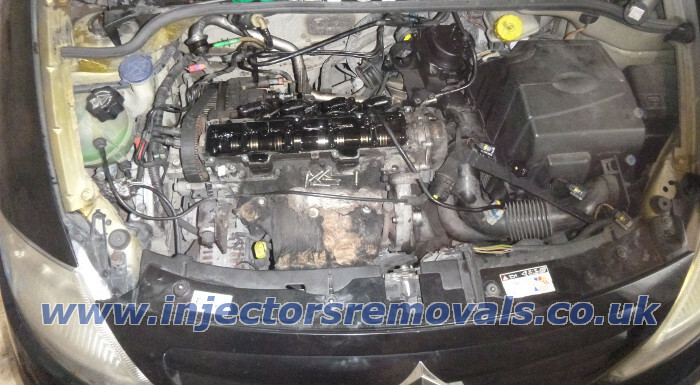 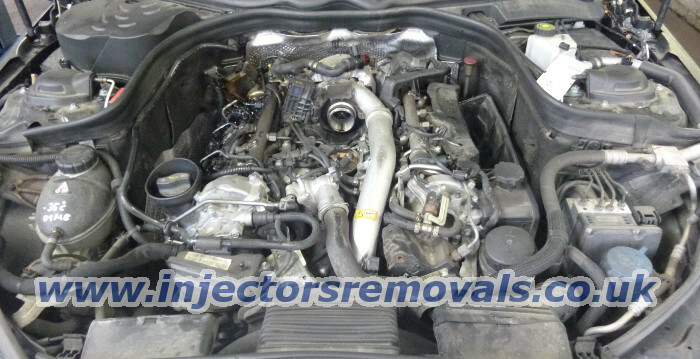 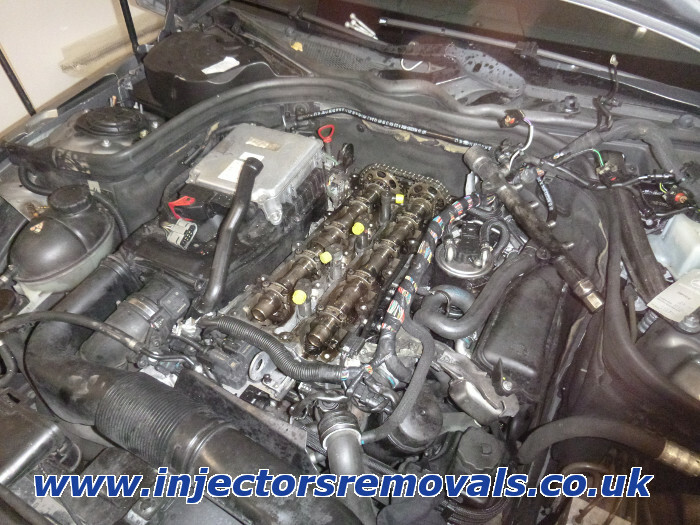 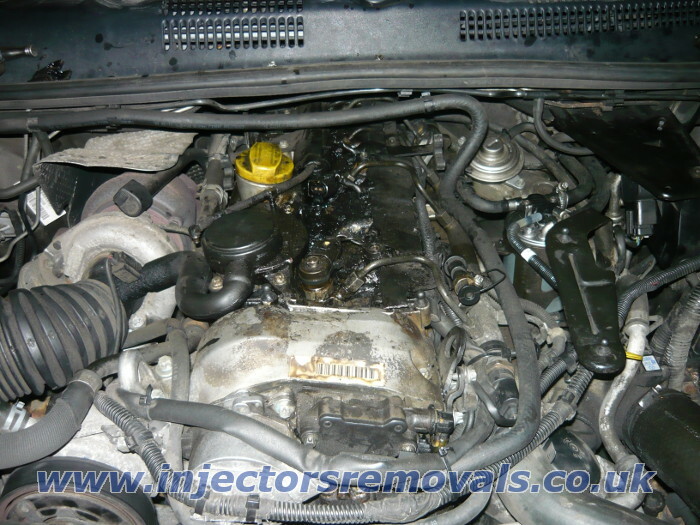 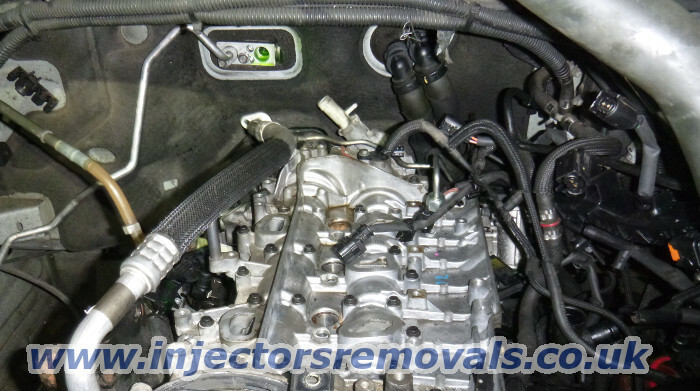 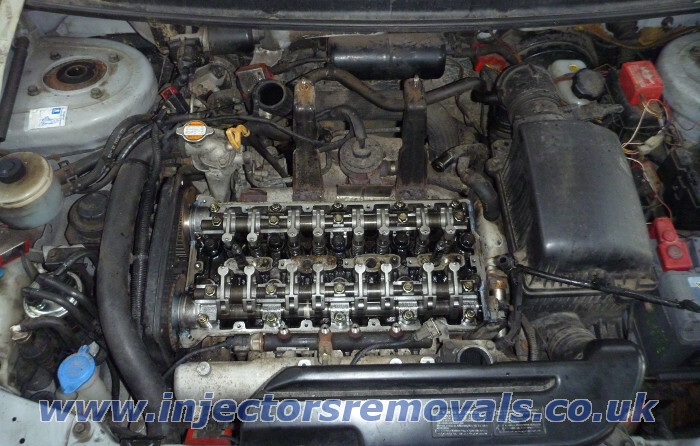 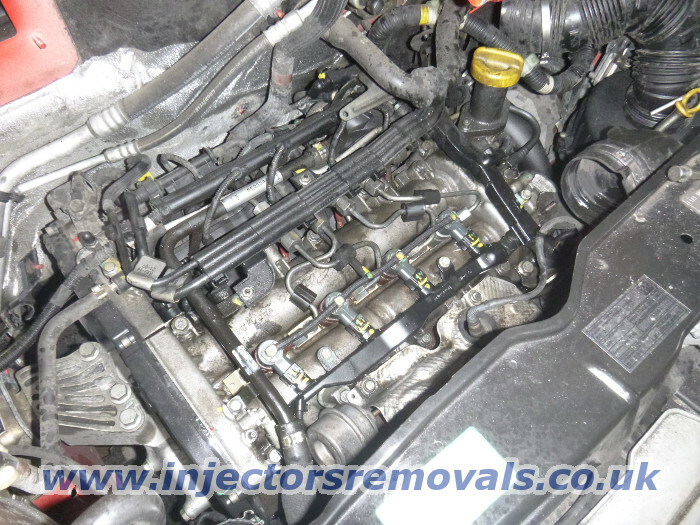 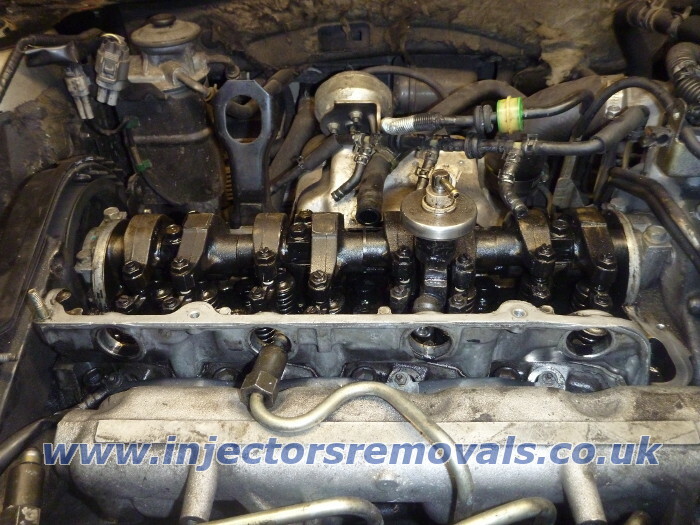 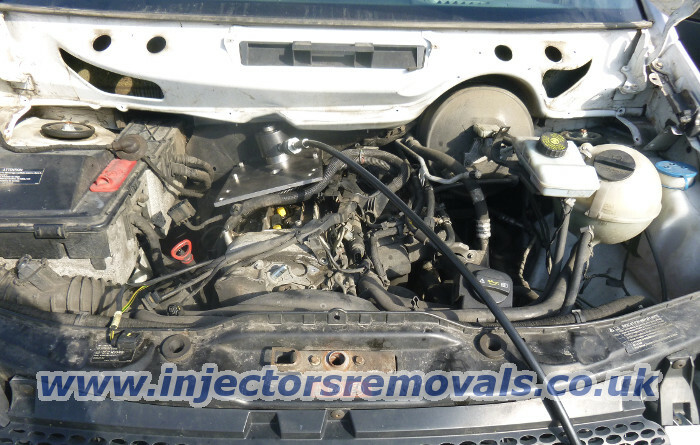 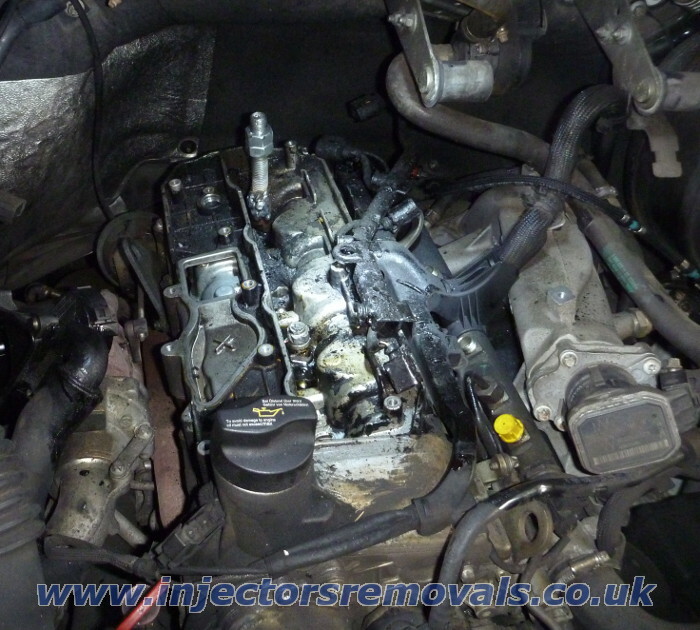 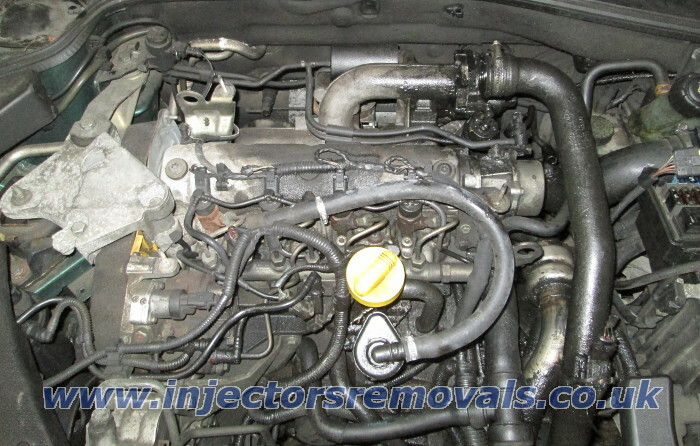 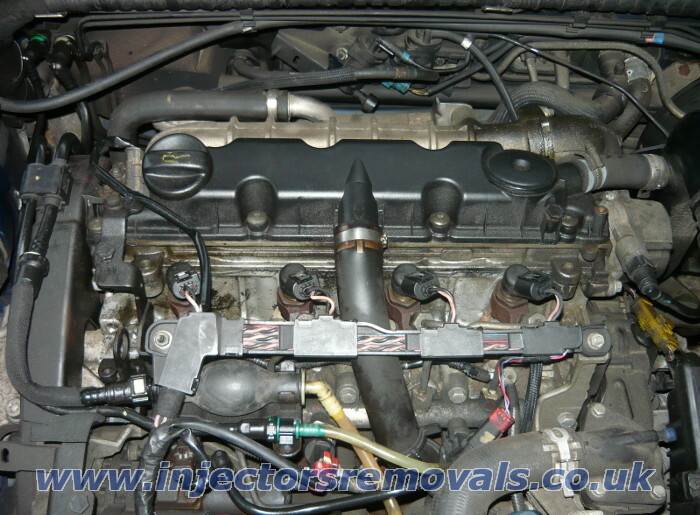 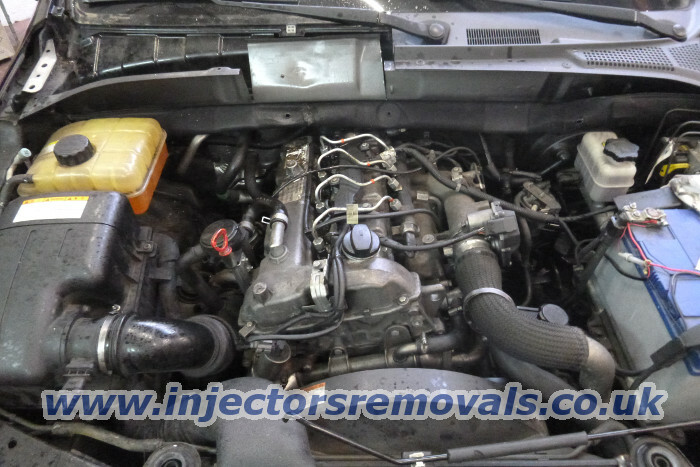 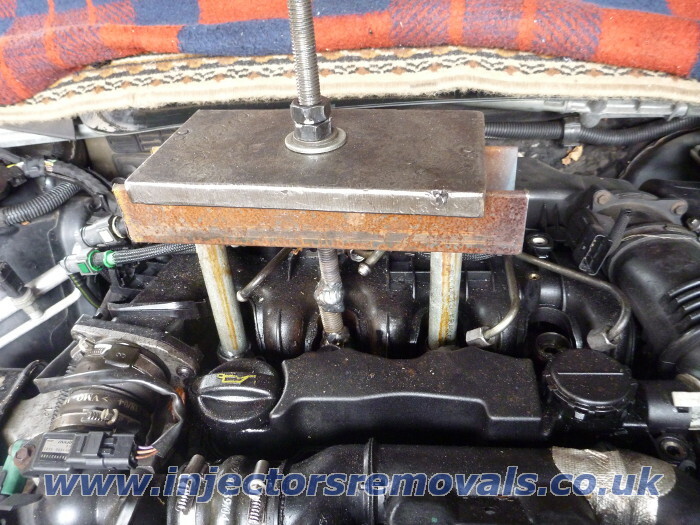 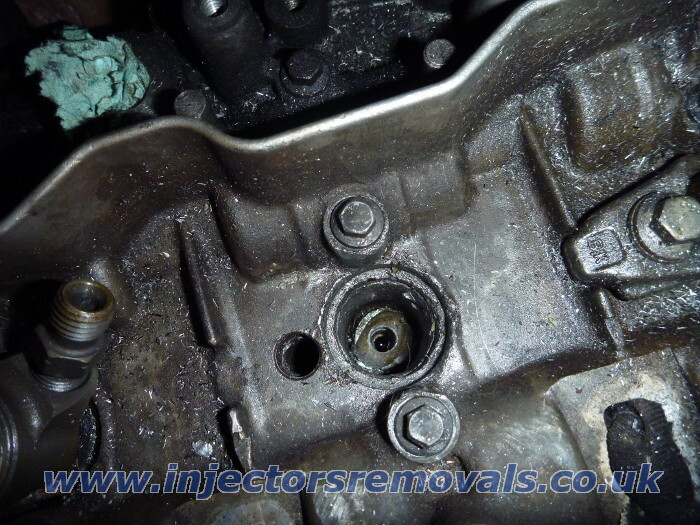 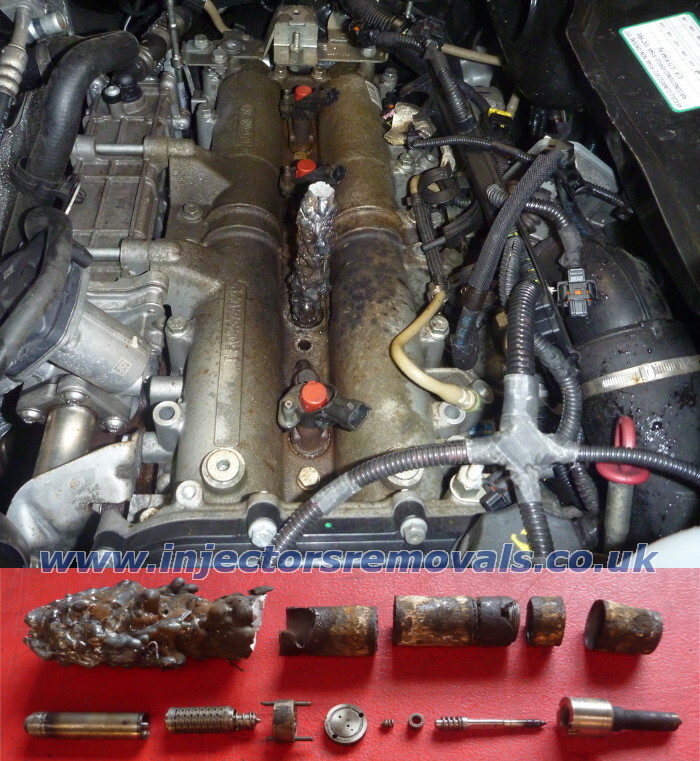 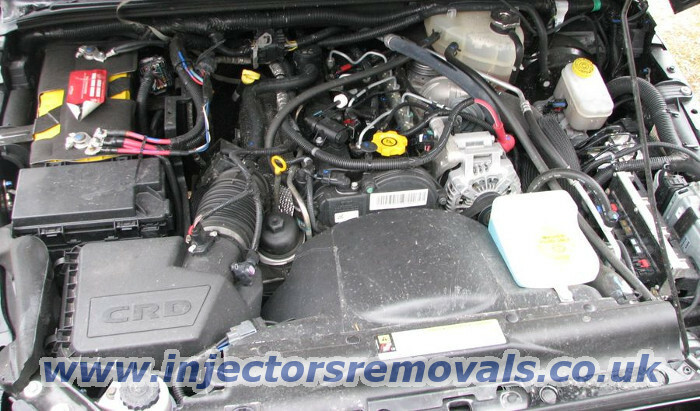 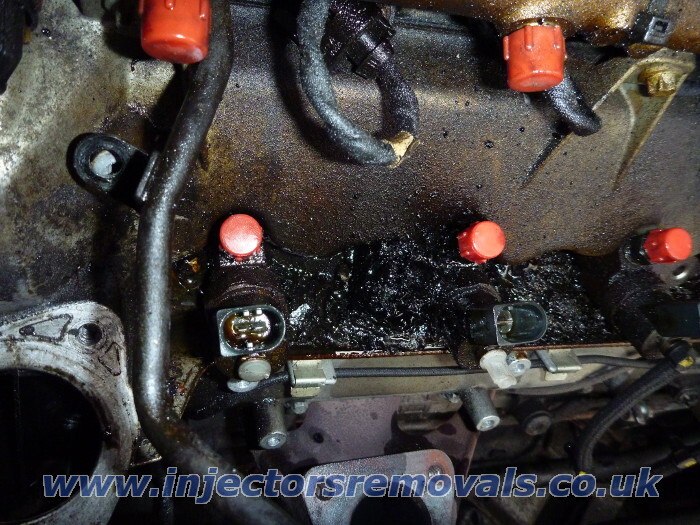 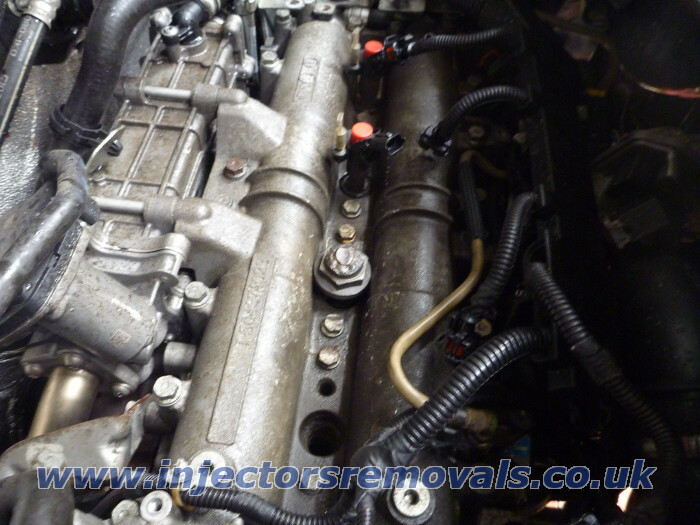 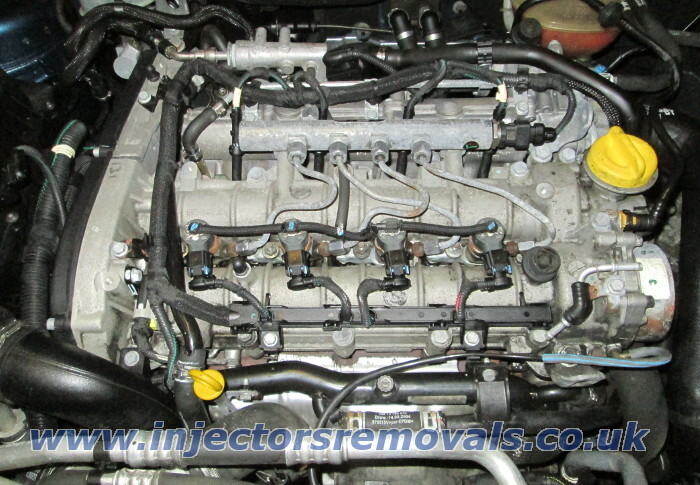 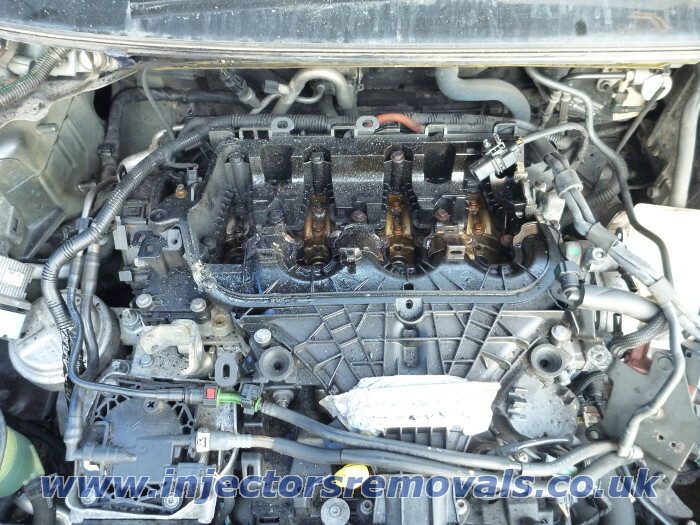 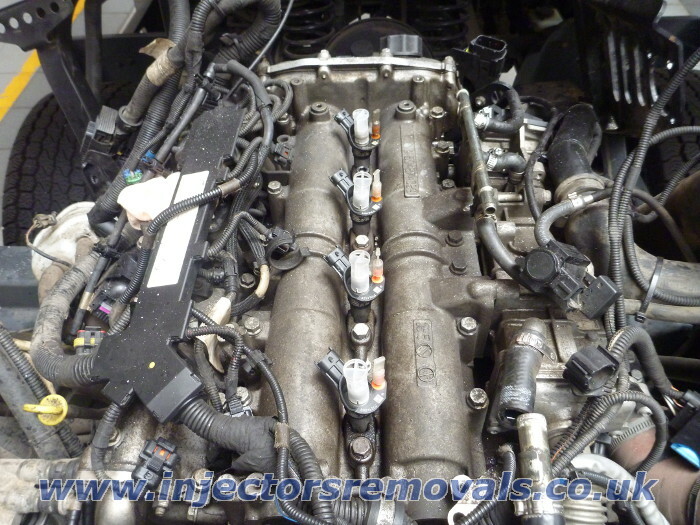 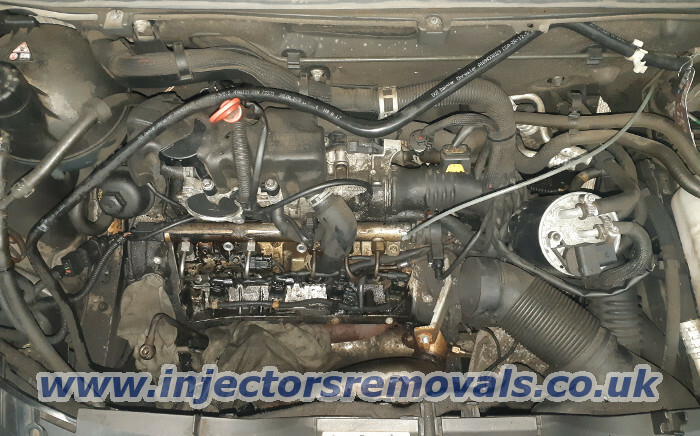 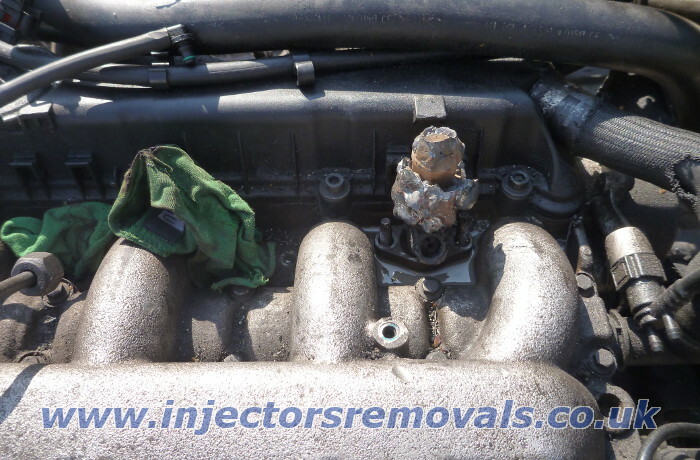 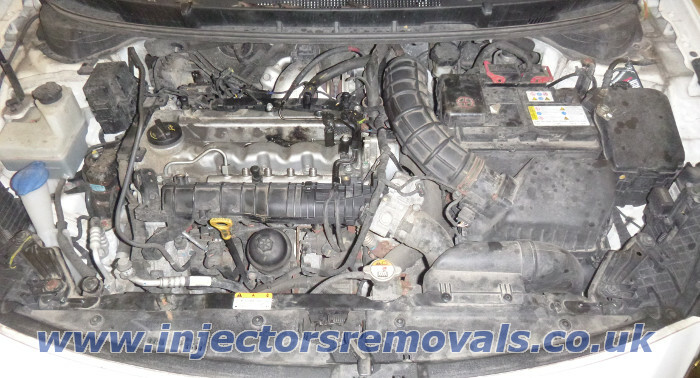 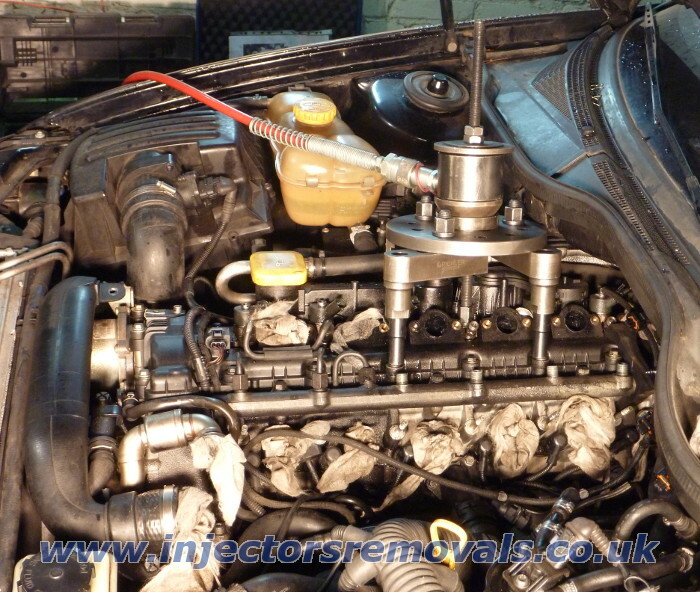 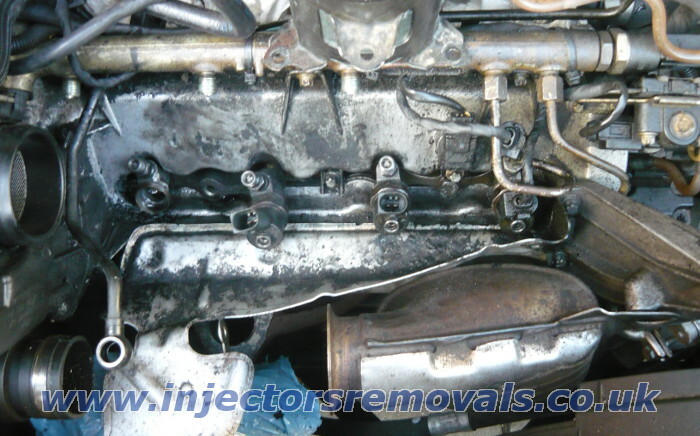 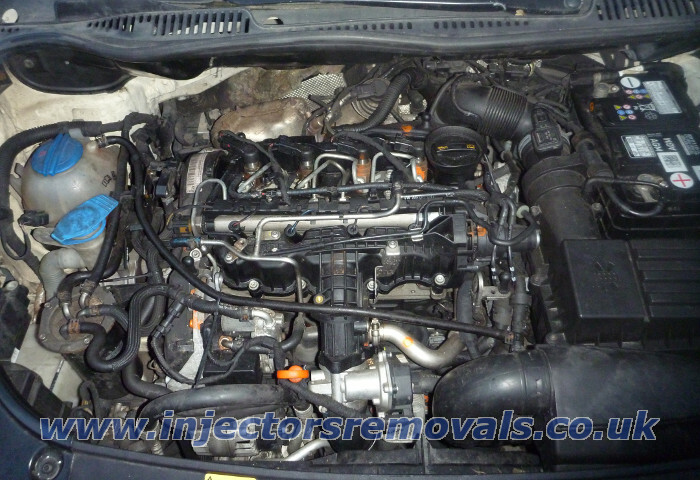 We do not charge for removing 2 injectors if you need to remove only one. 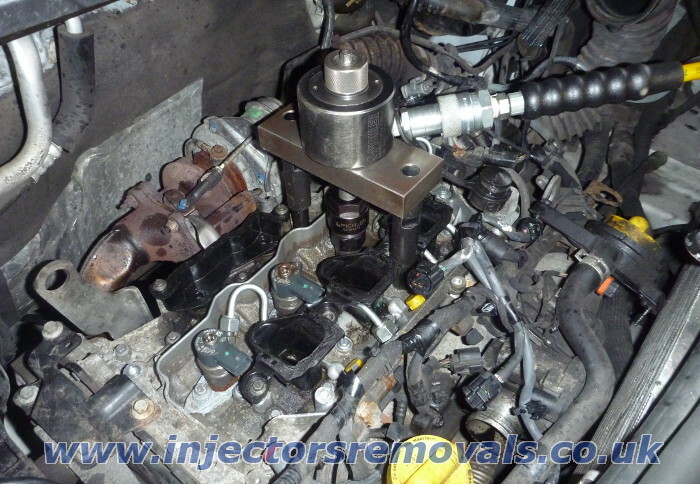 You don't have to pay ANY MONEY if injector won't be removed !!! 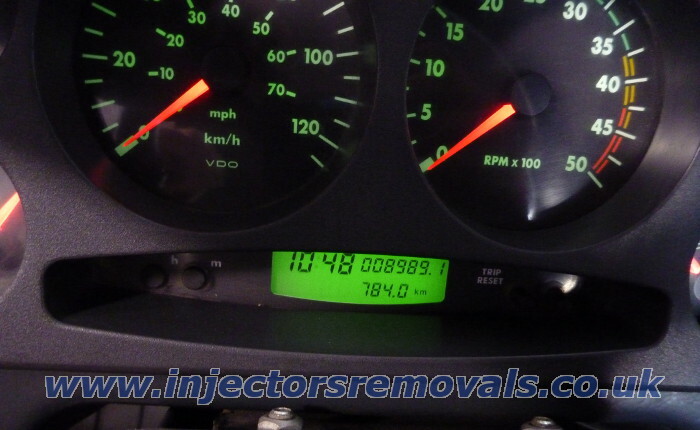 so better prepare cash because we don't work for bank transfer. 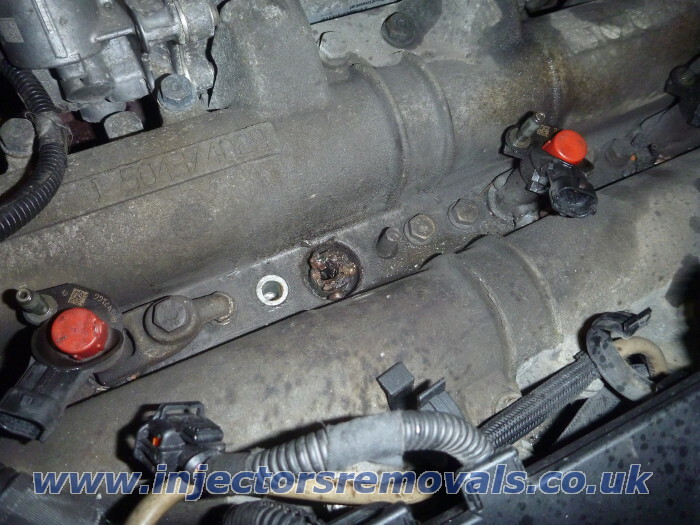 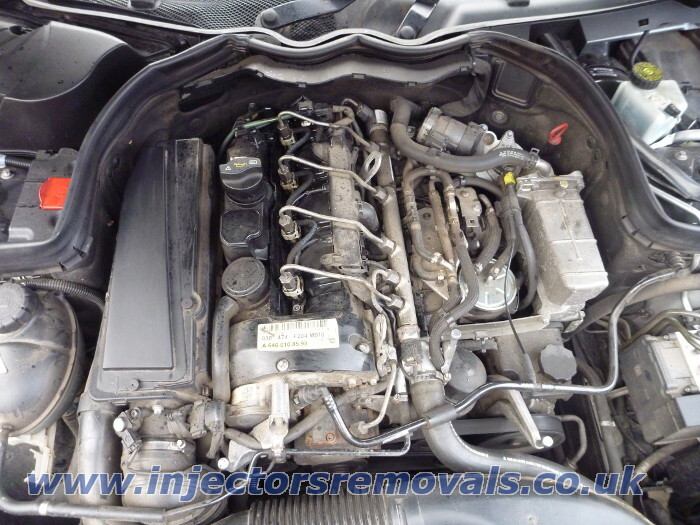 Price for standard removal of first injector if not snap - £100. 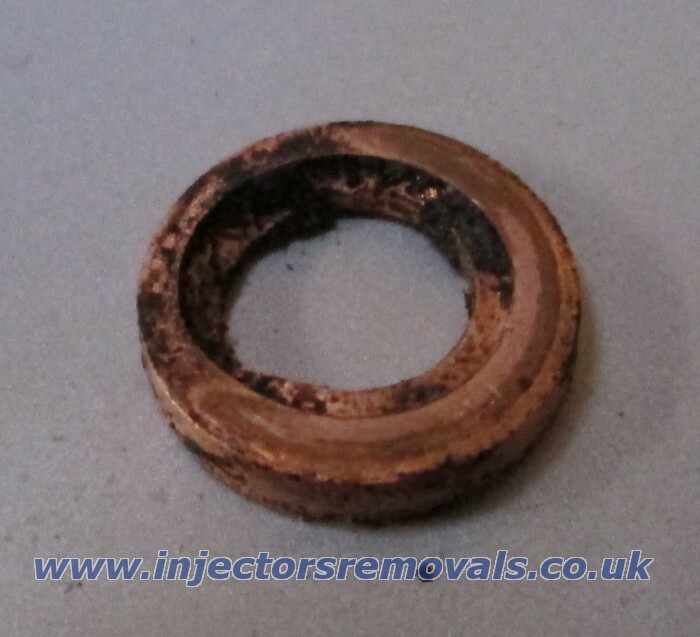 for extra payment - another £100. 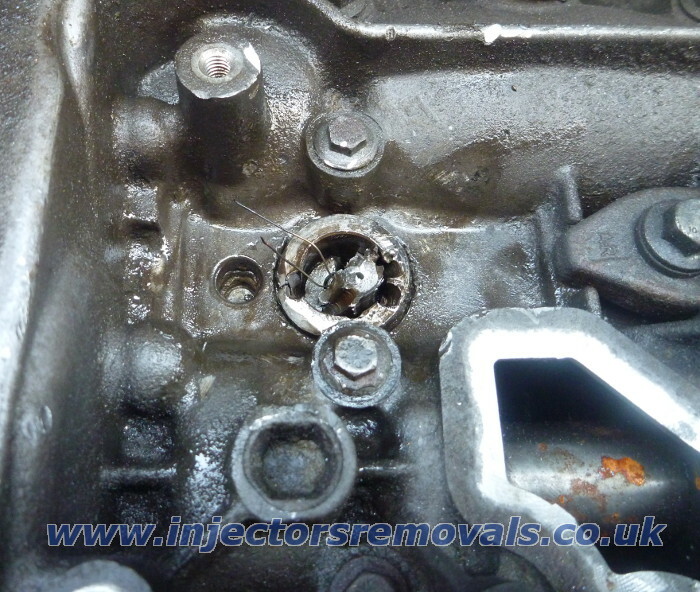 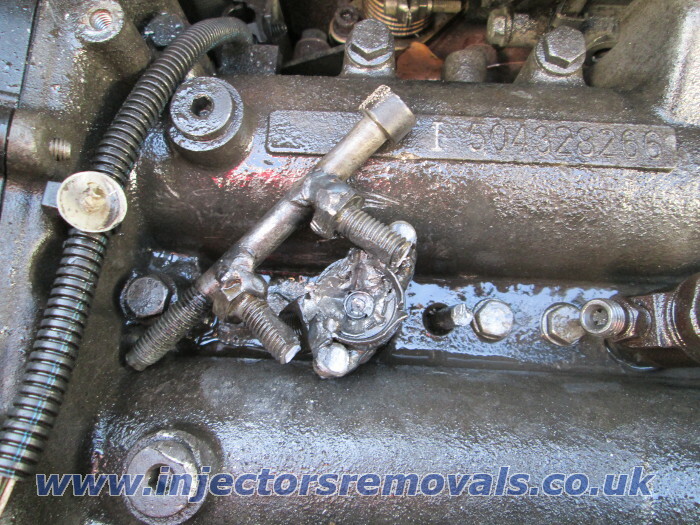 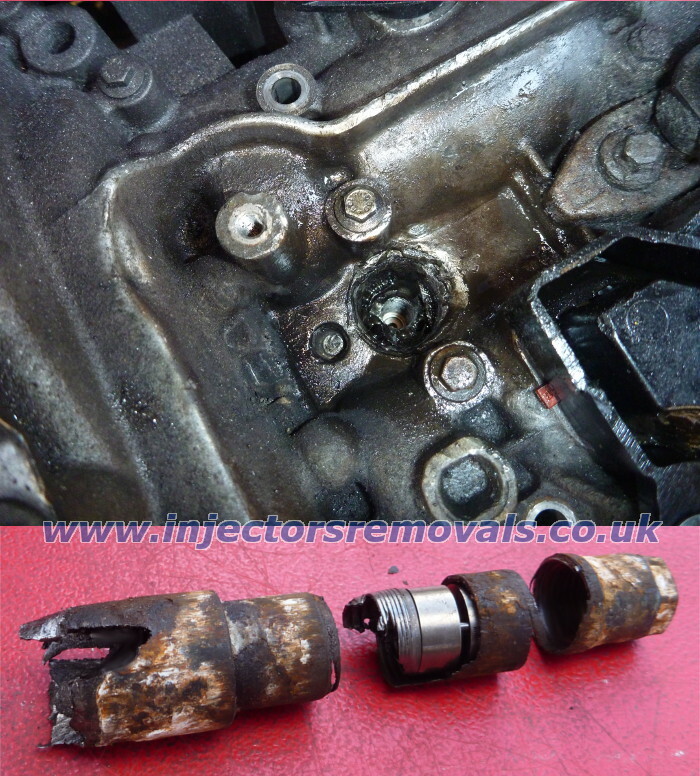 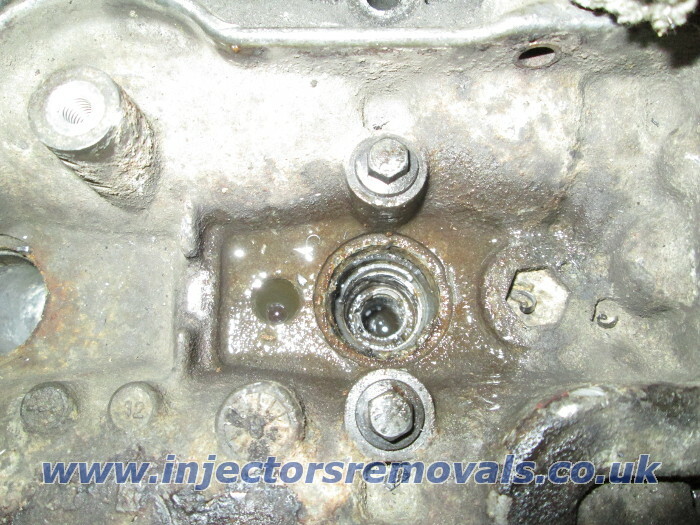 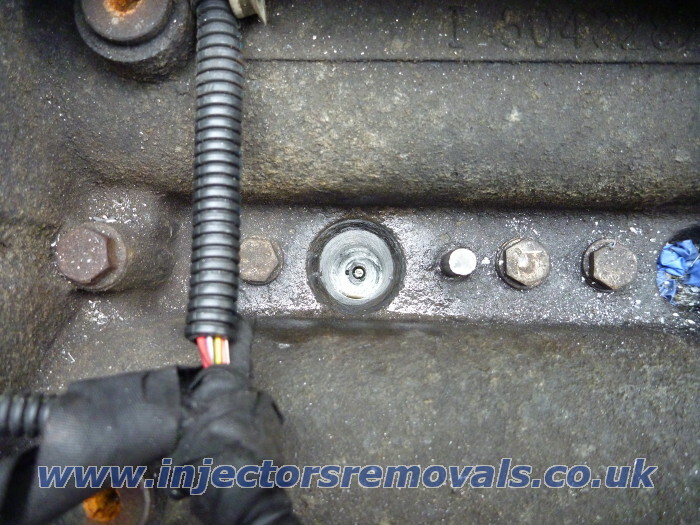 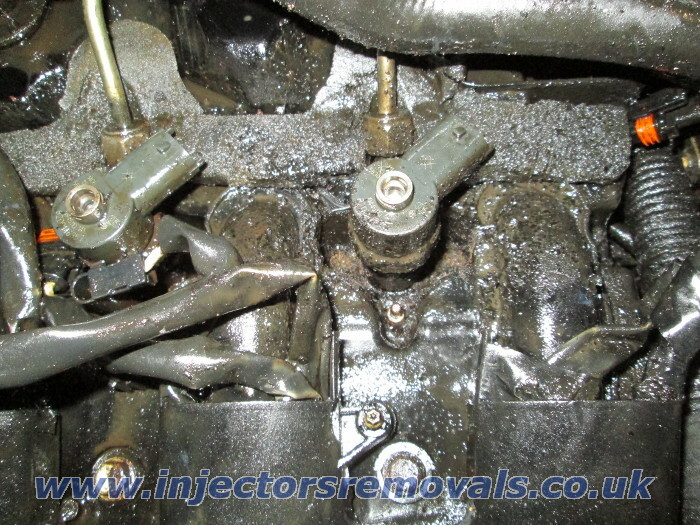 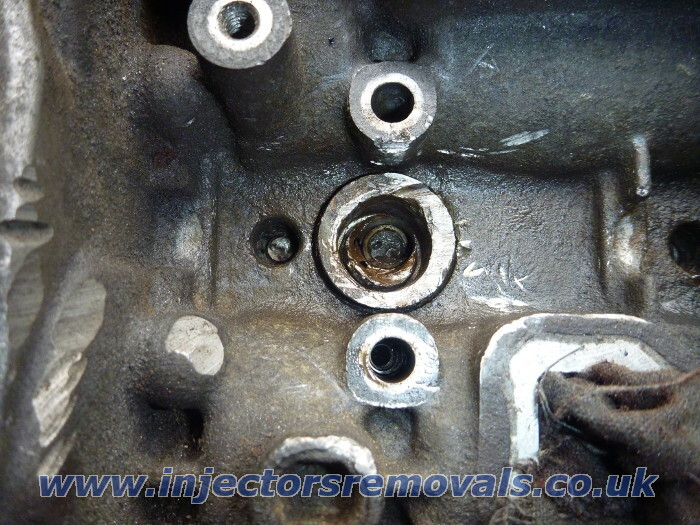 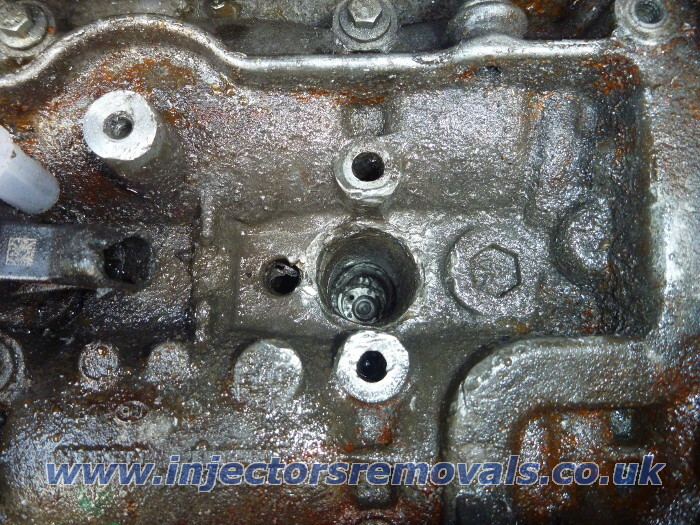 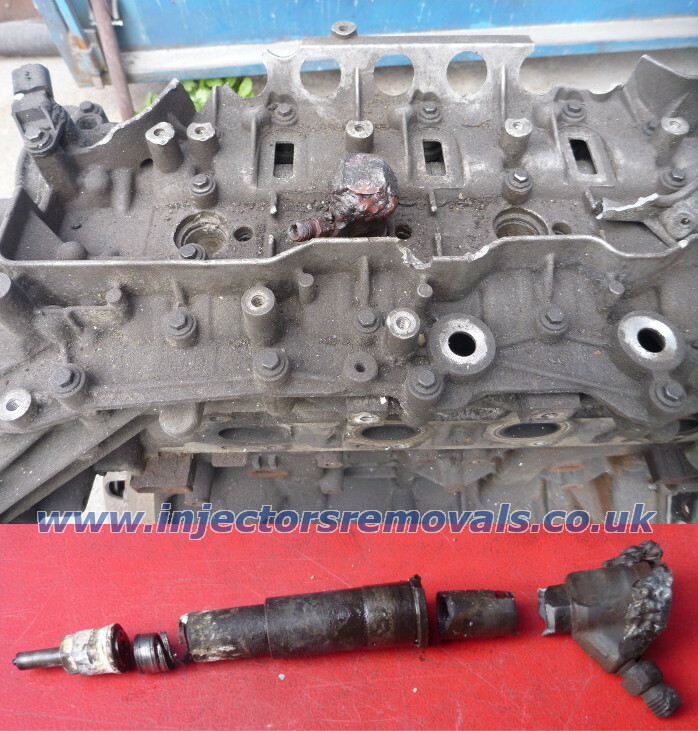 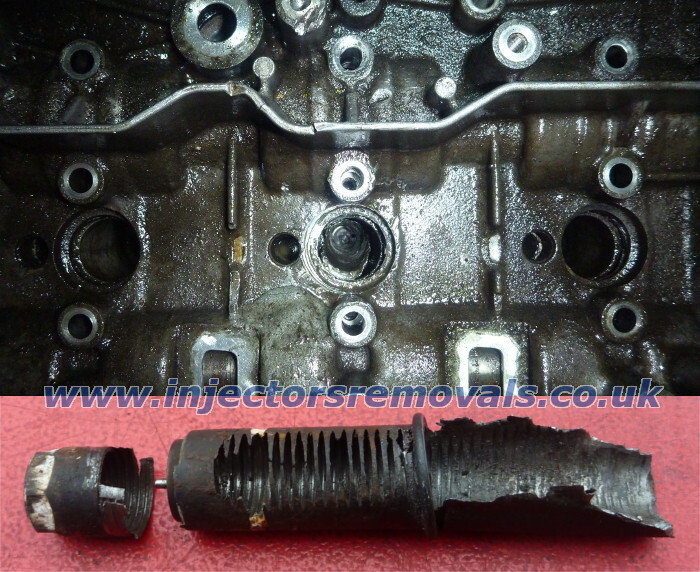 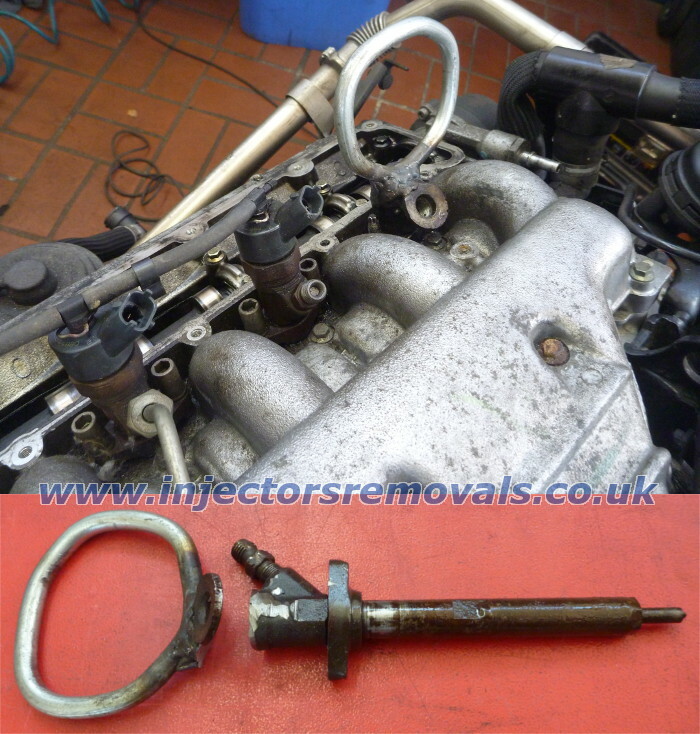 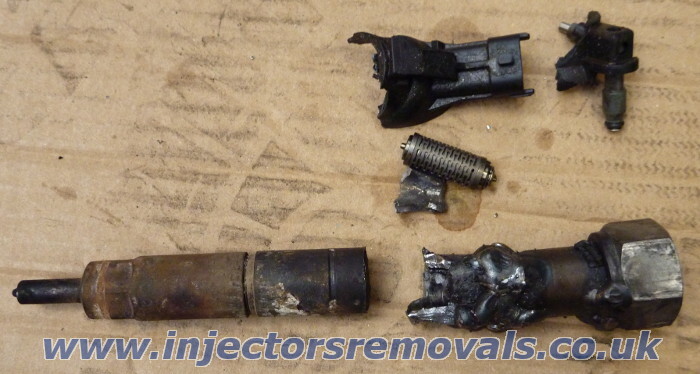 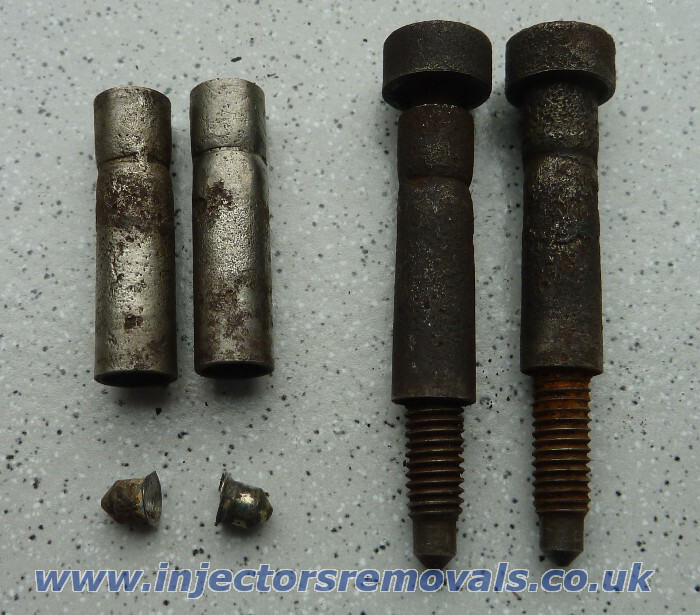 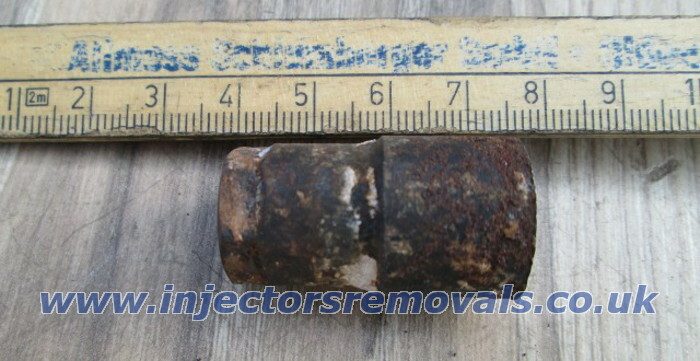 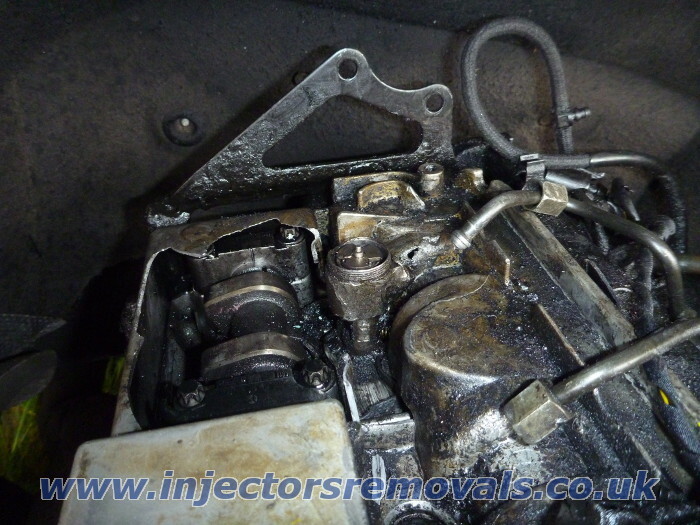 Removal injector with broken threads or which has been already welded costs £200 each. 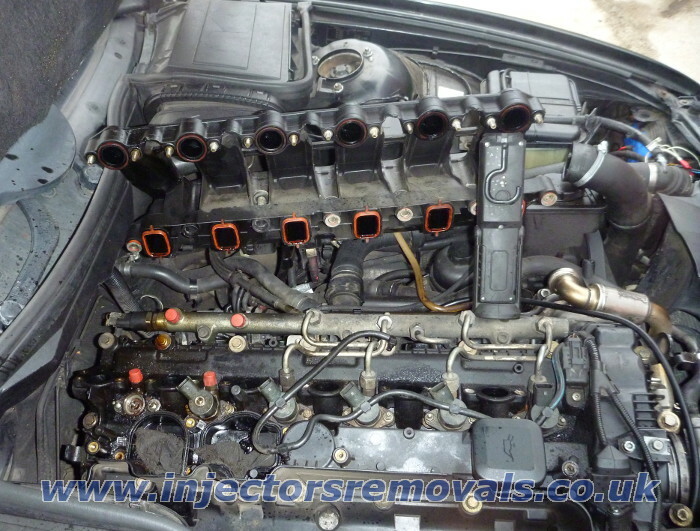 or £300 each when snap and needs to be removed in parts. 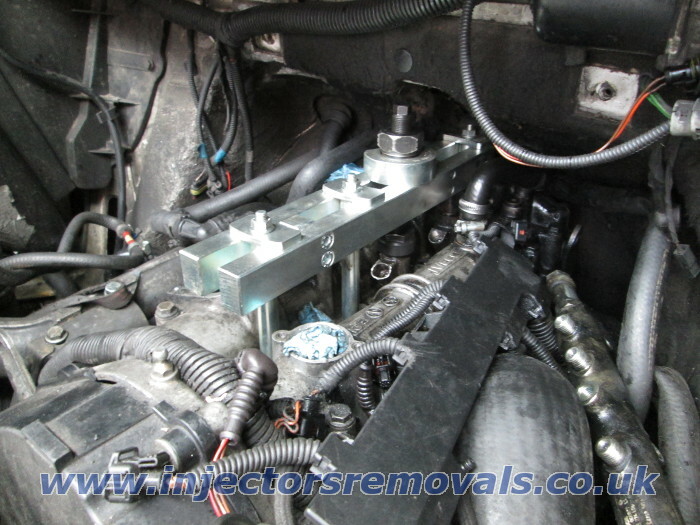 and will charge you fuel surcharge 60p per mile one way from our place to your home / garage / workshop. 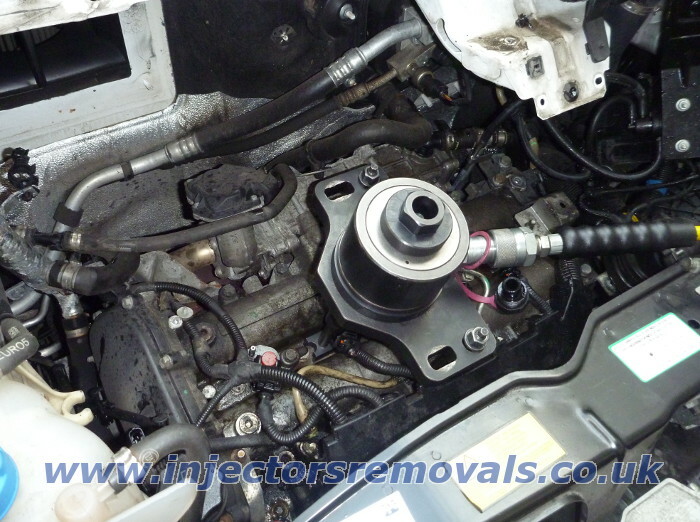 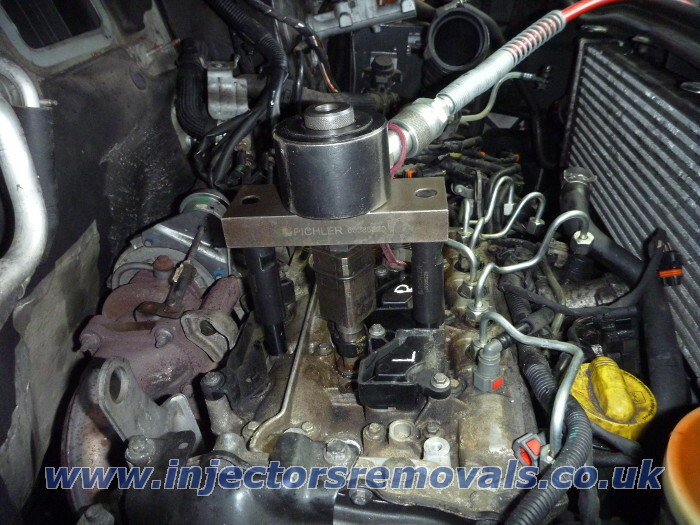 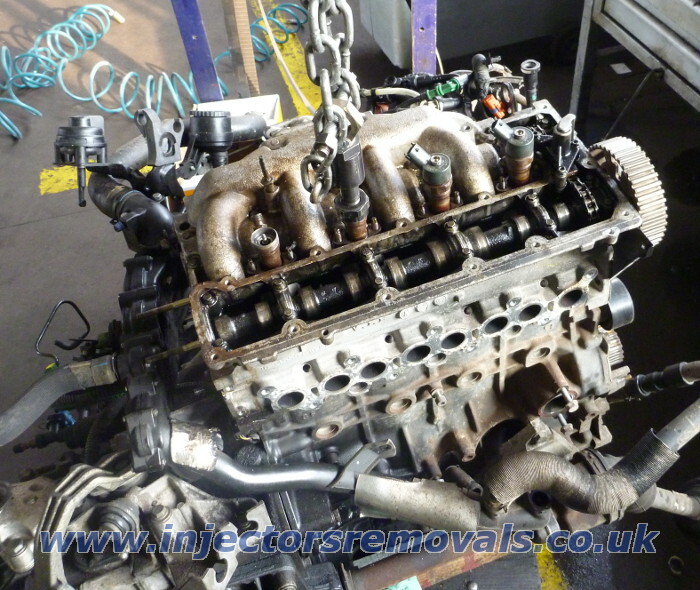 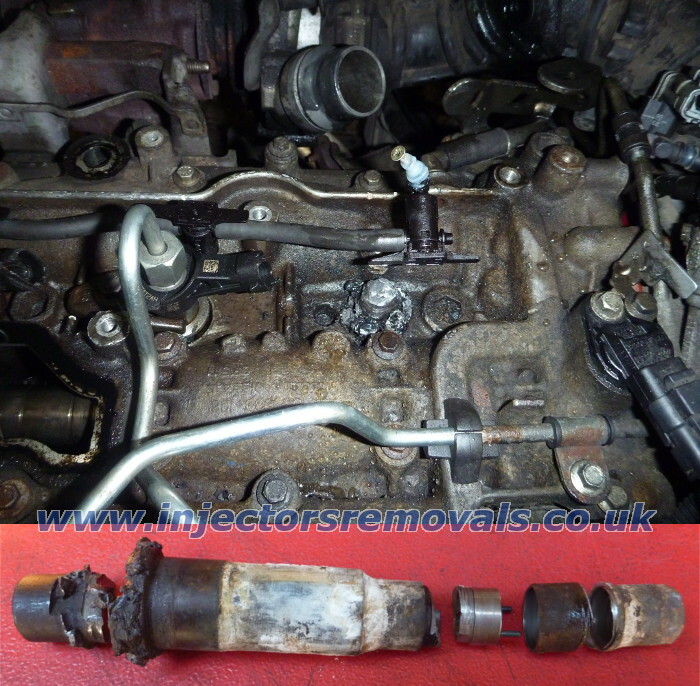 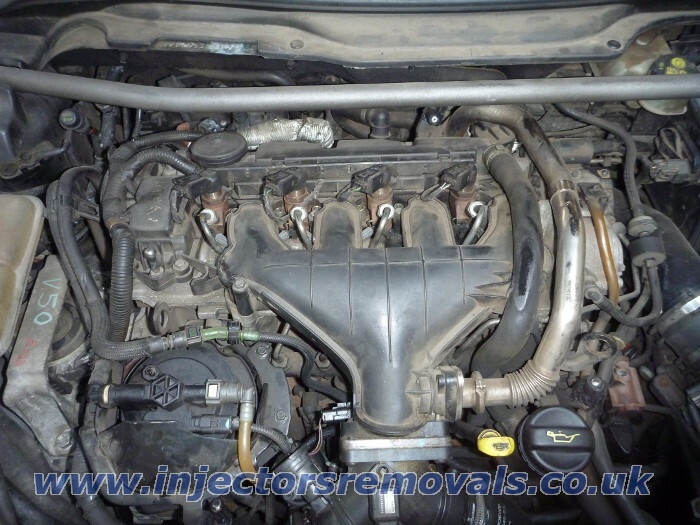 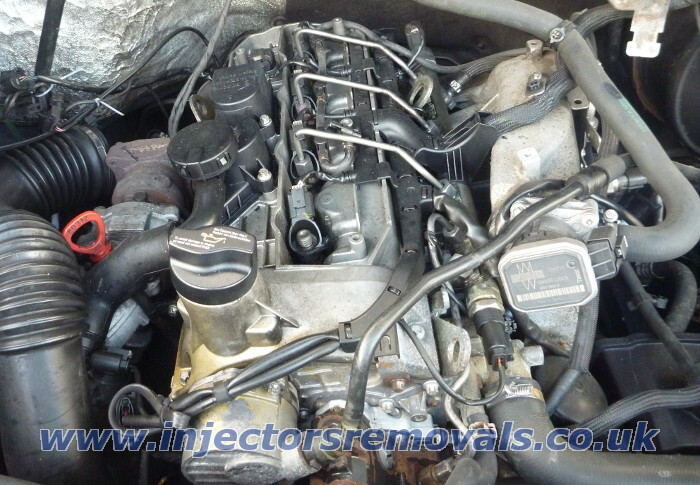 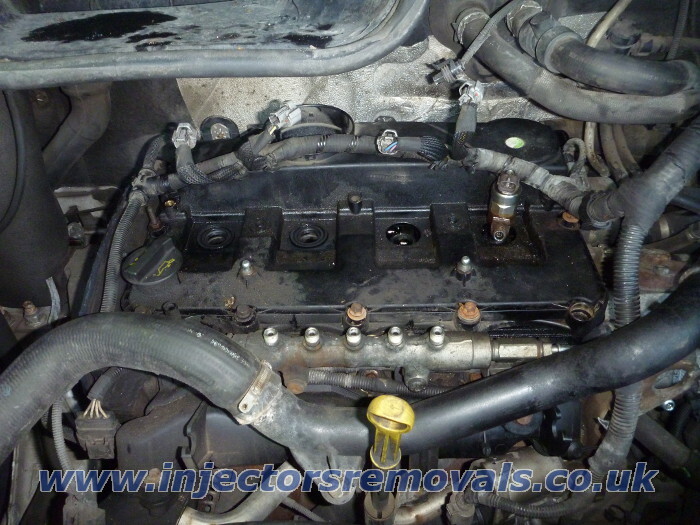 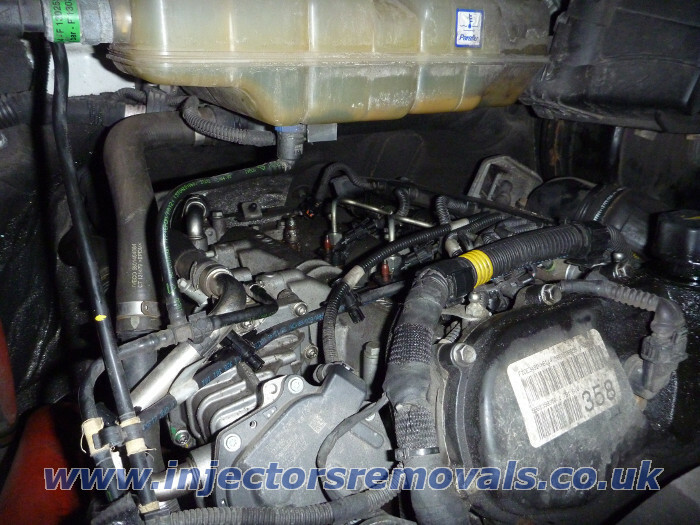 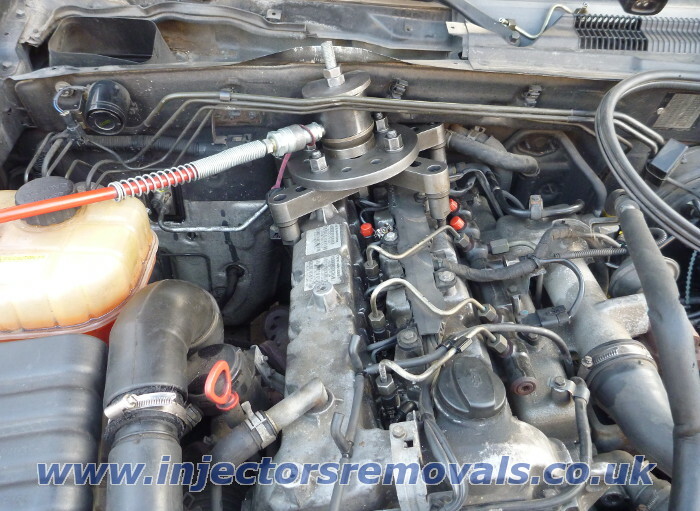 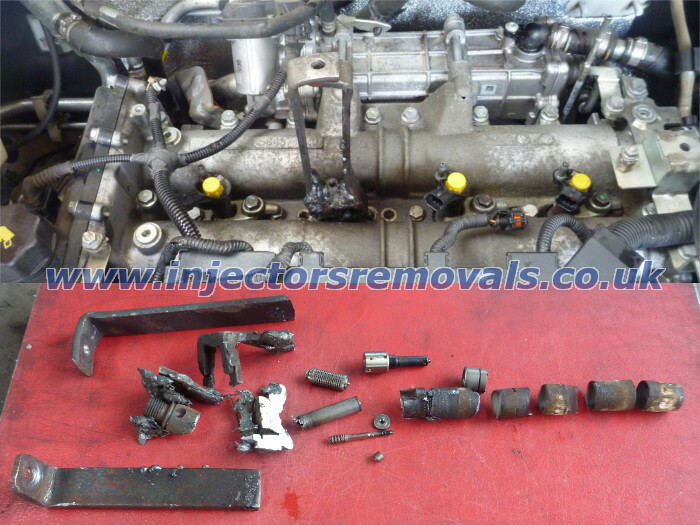 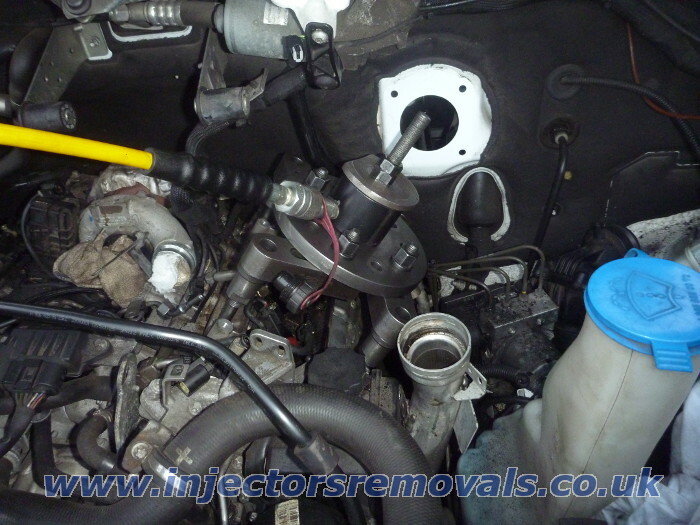 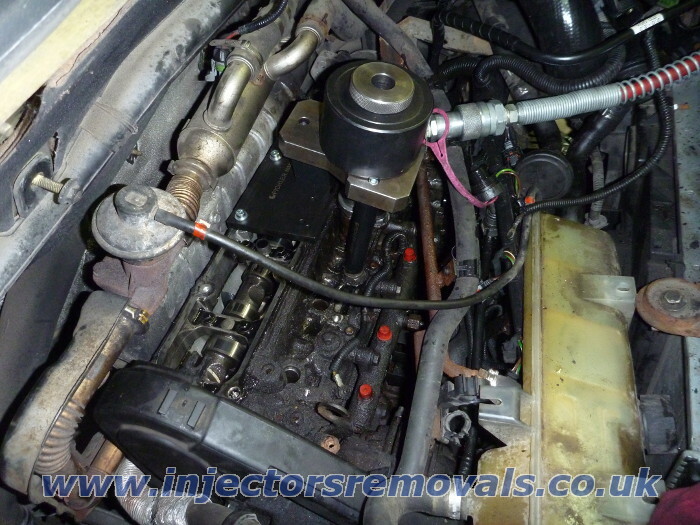 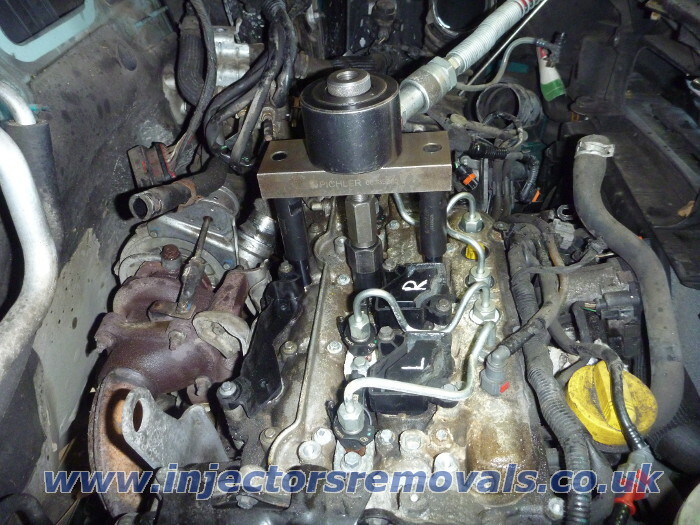 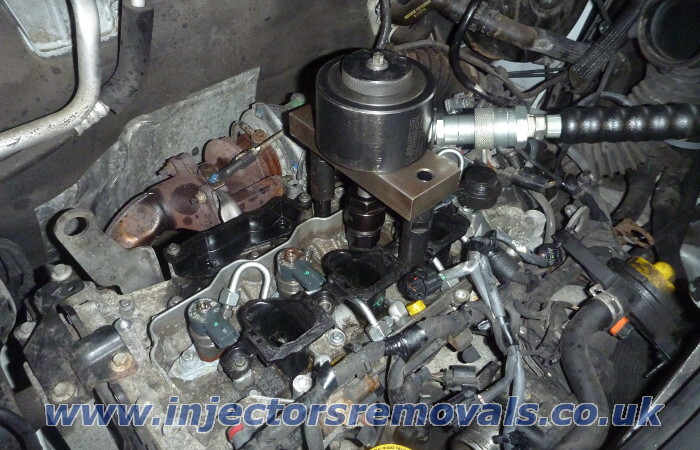 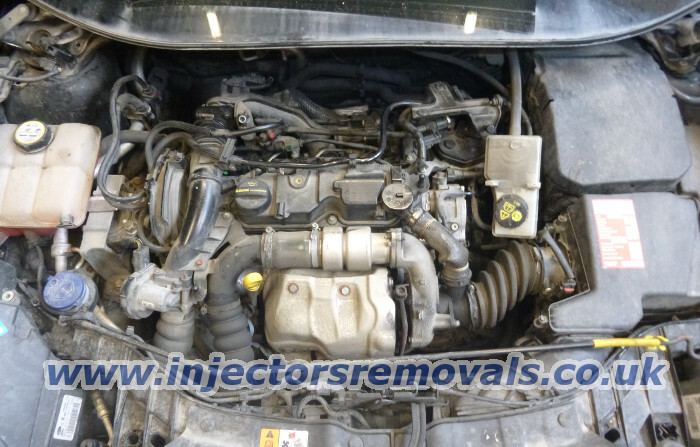 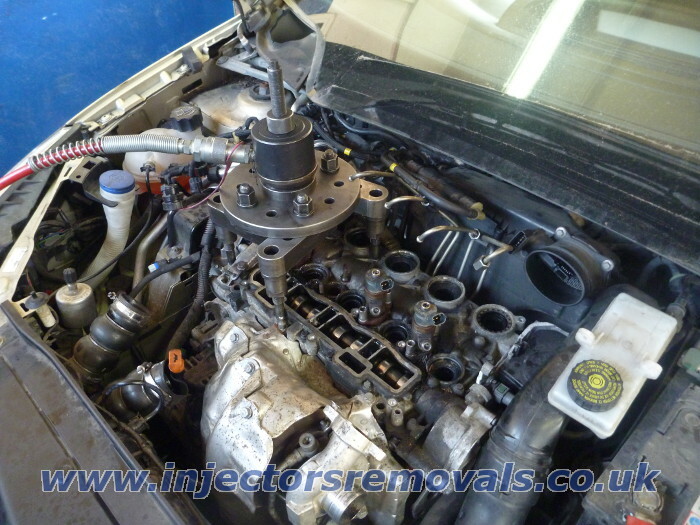 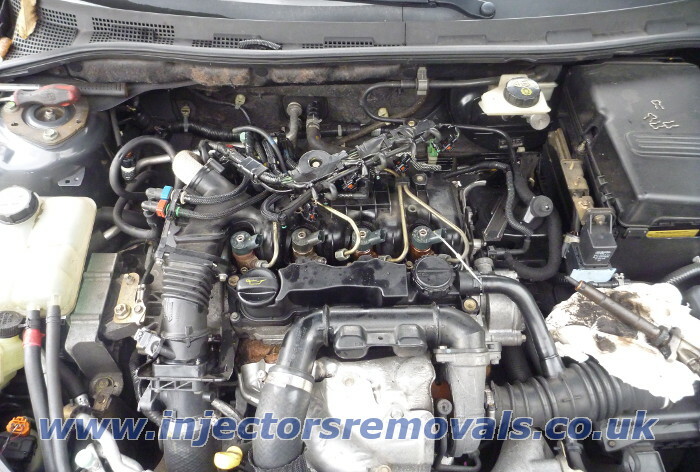 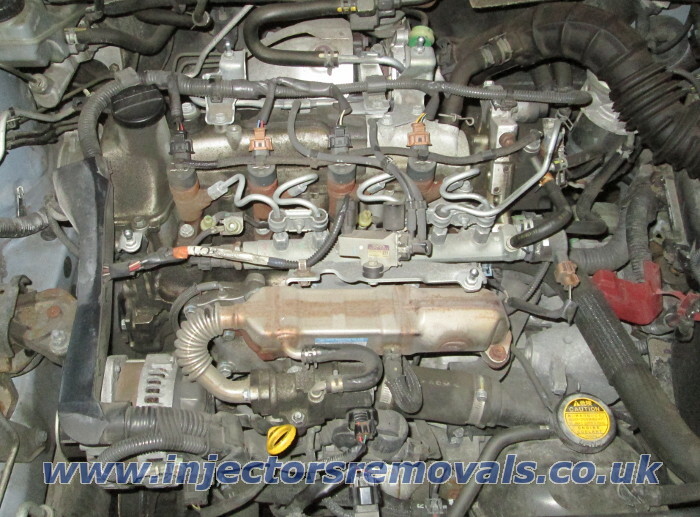 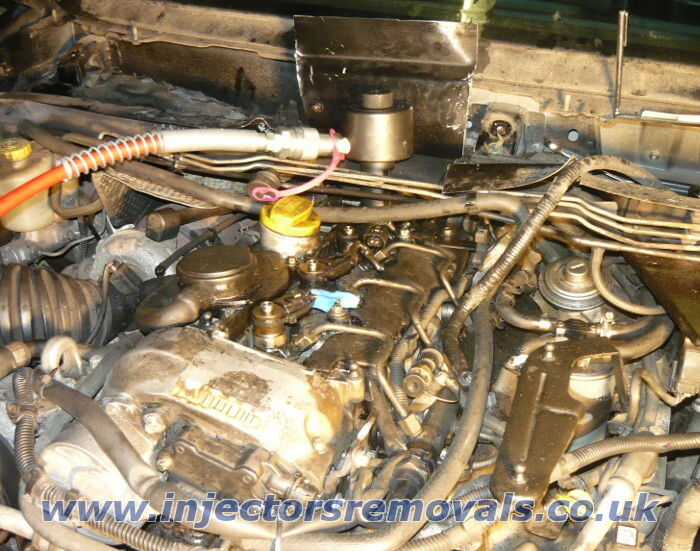 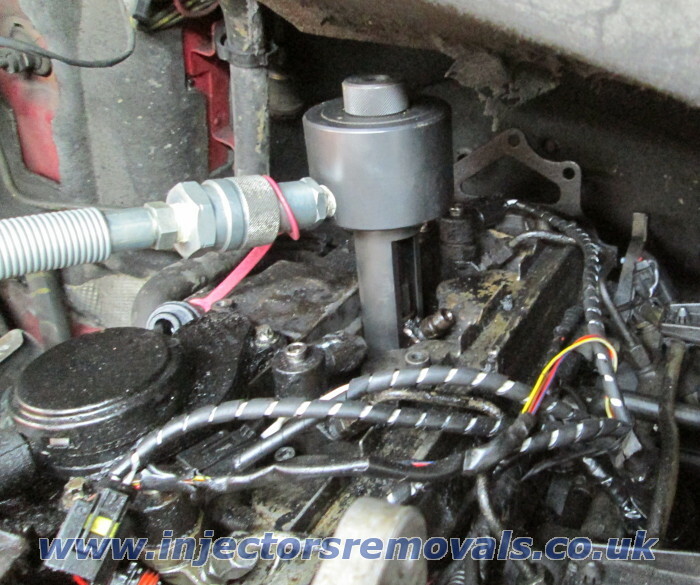 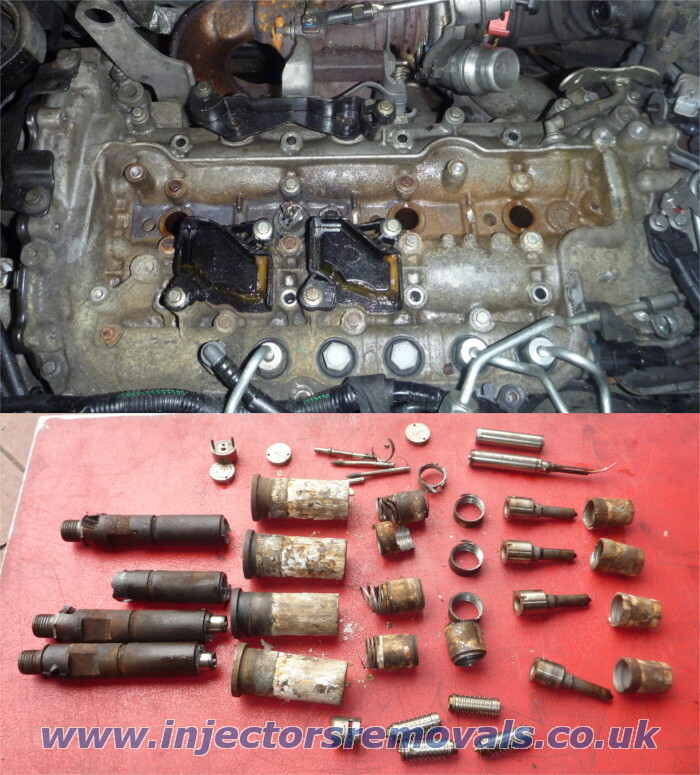 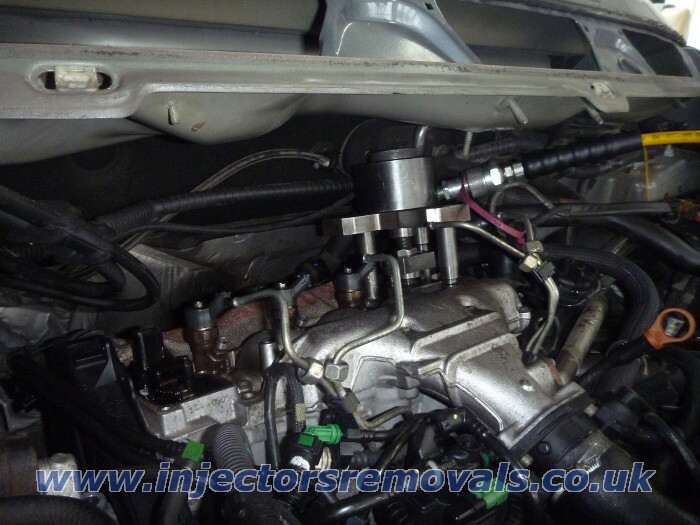 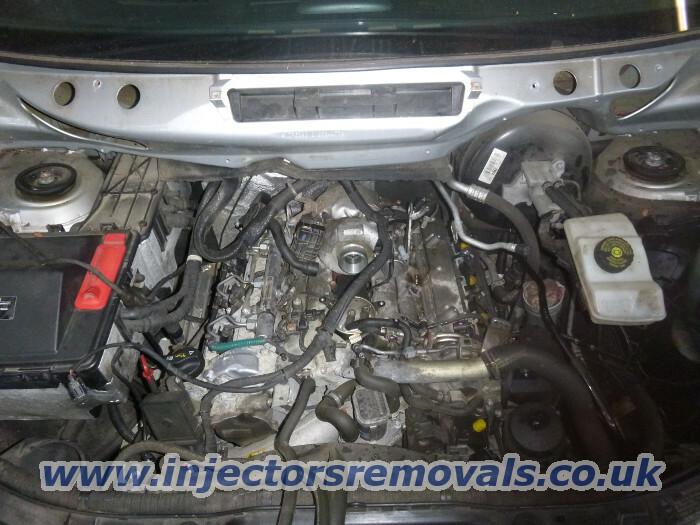 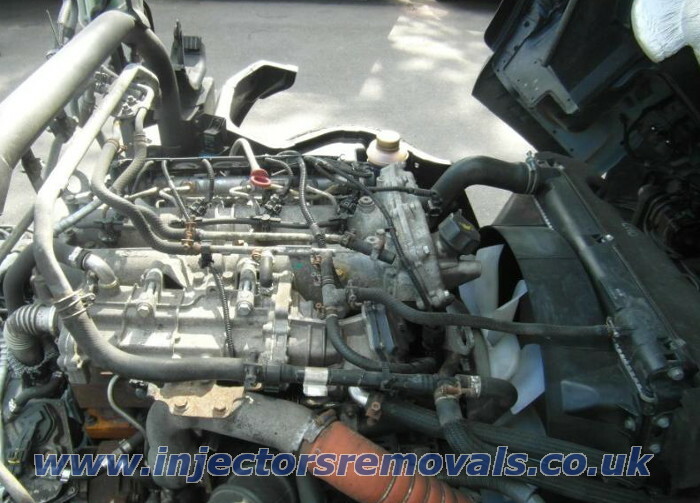 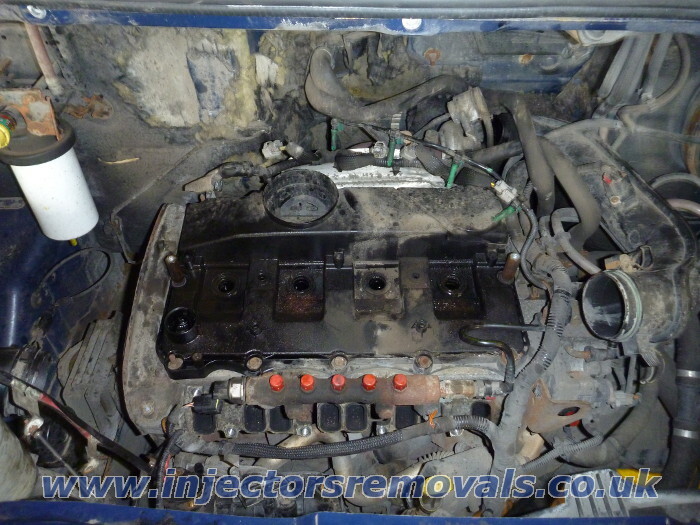 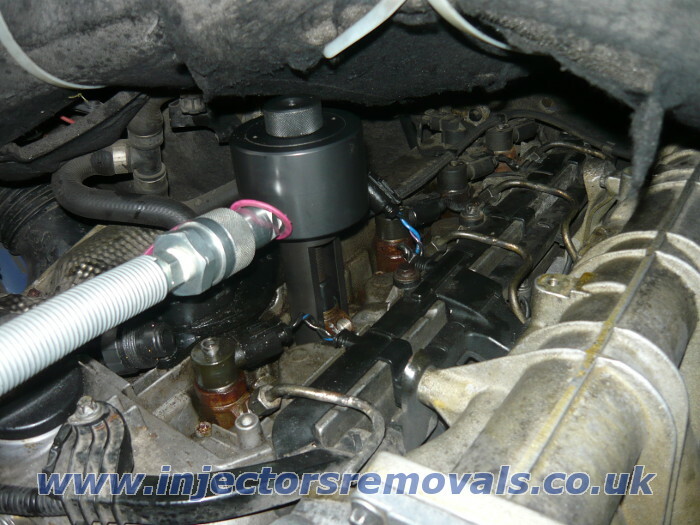 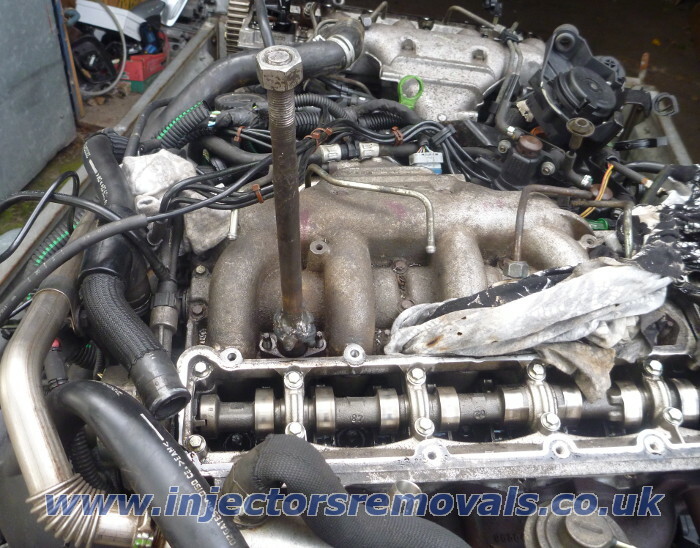 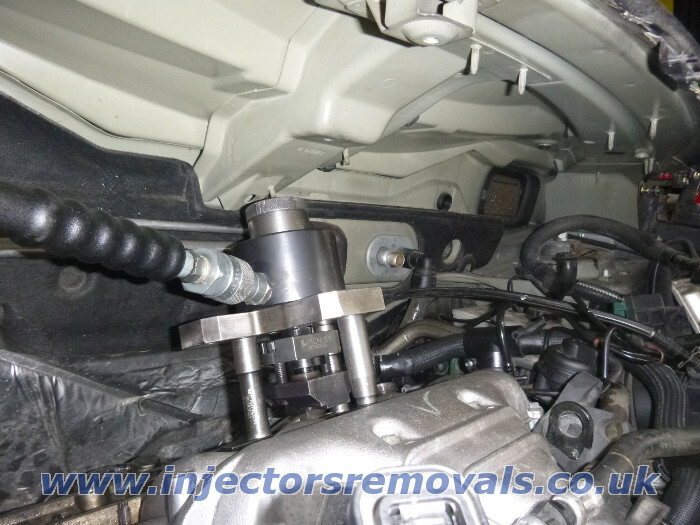 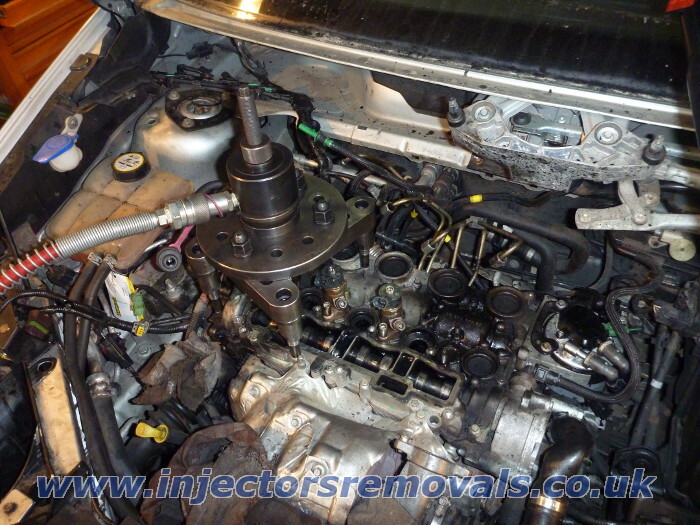 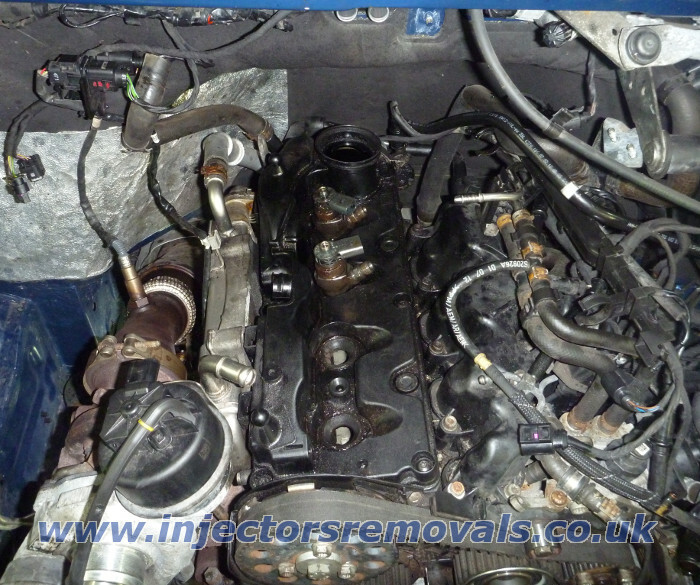 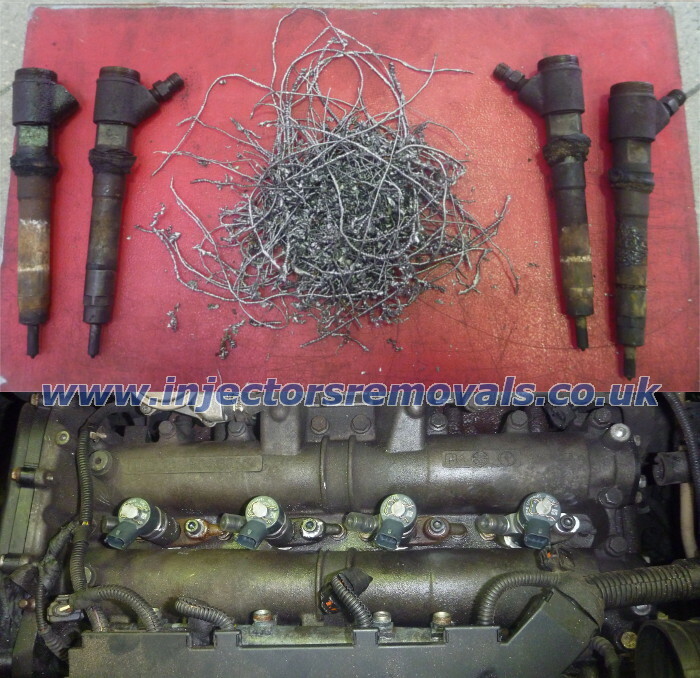 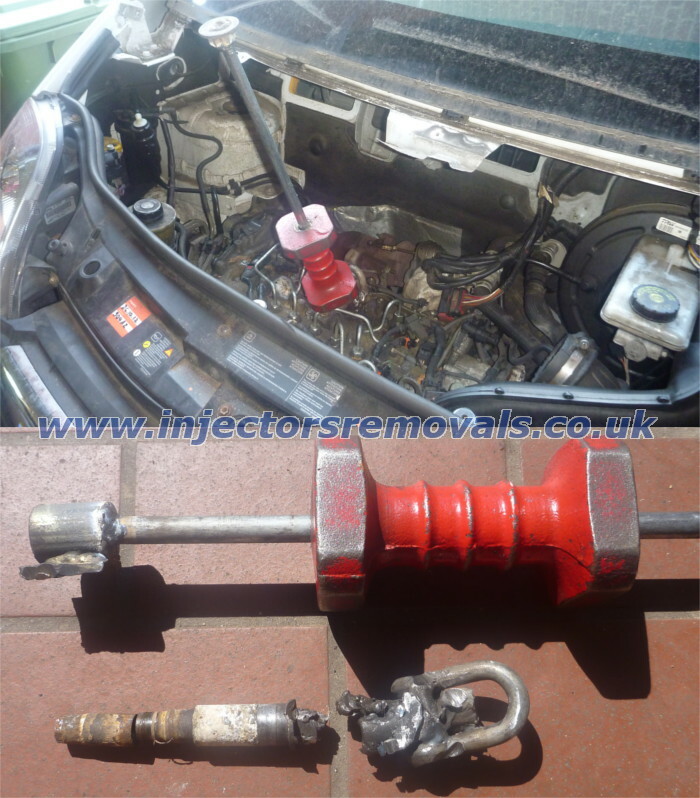 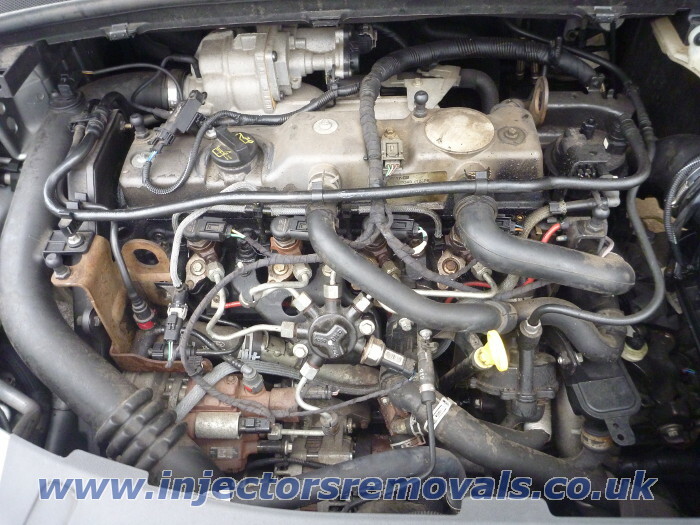 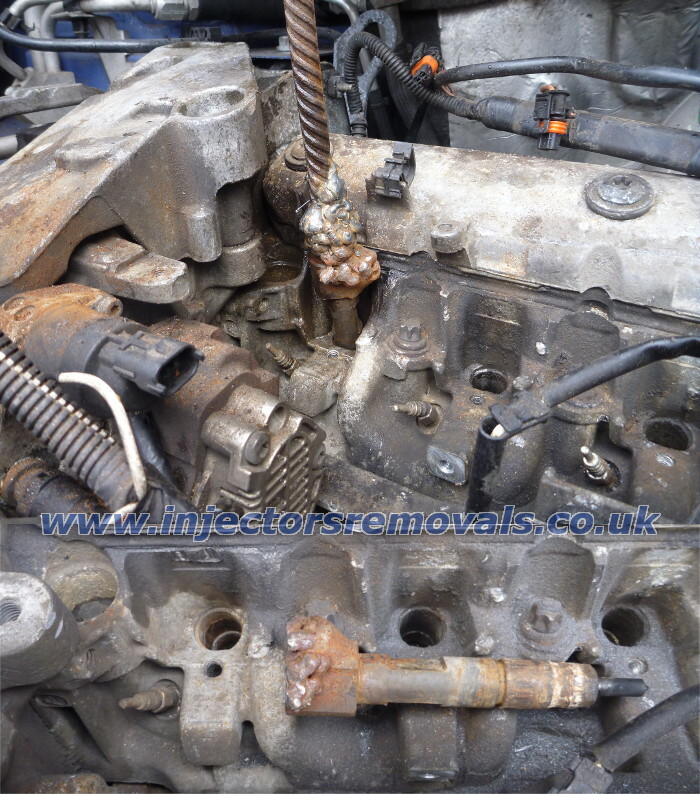 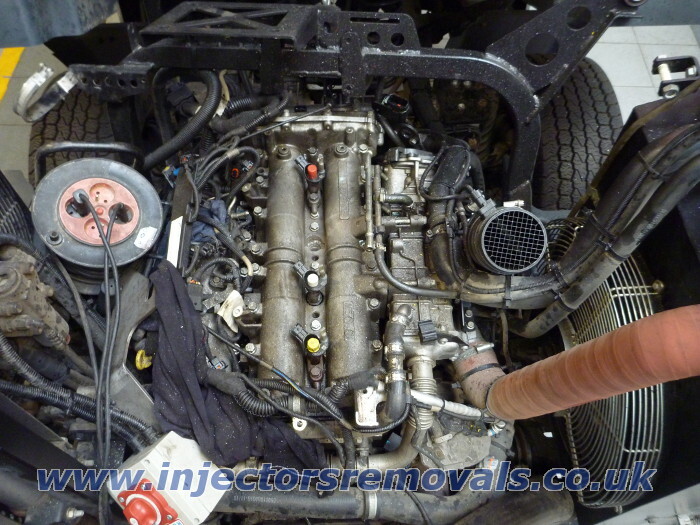 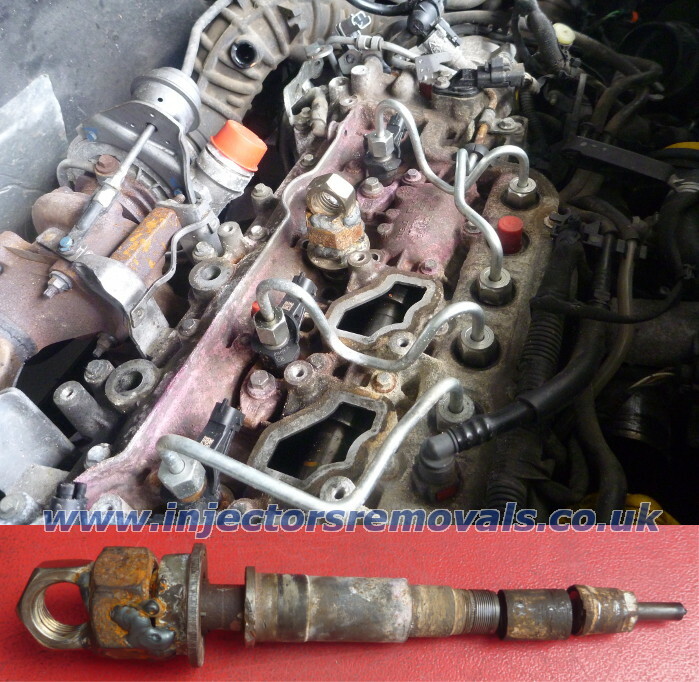 we can apply another injector and put all parts back to make your van fully roadworthy. 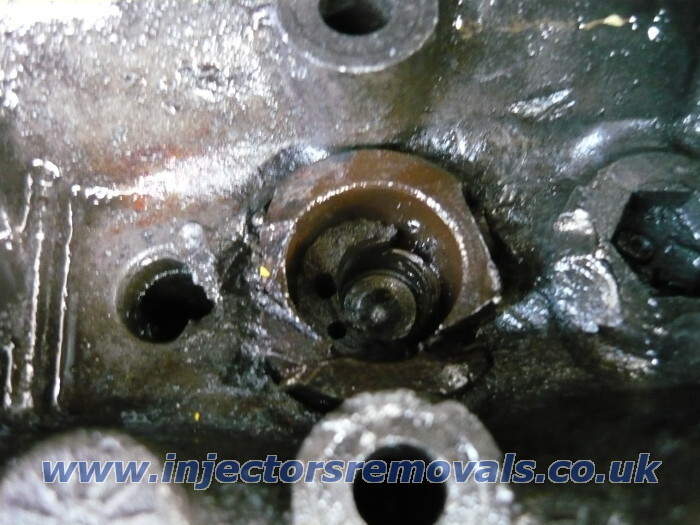 just under fuel canals inside the injector showed below. 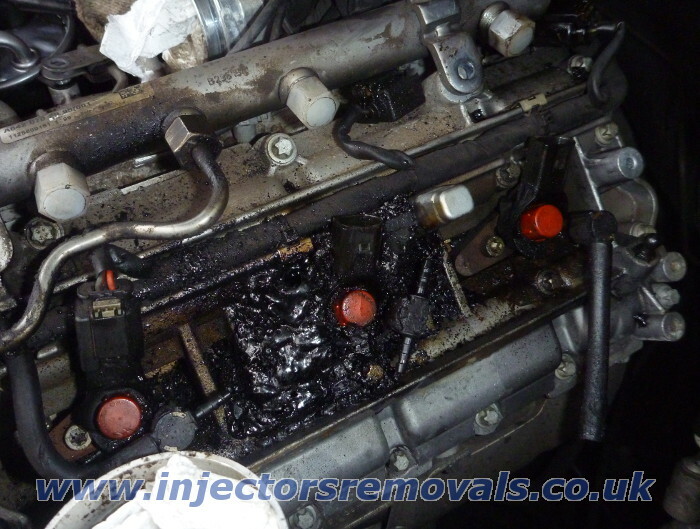 and injectors flooded with black glop from exhaust gasses. 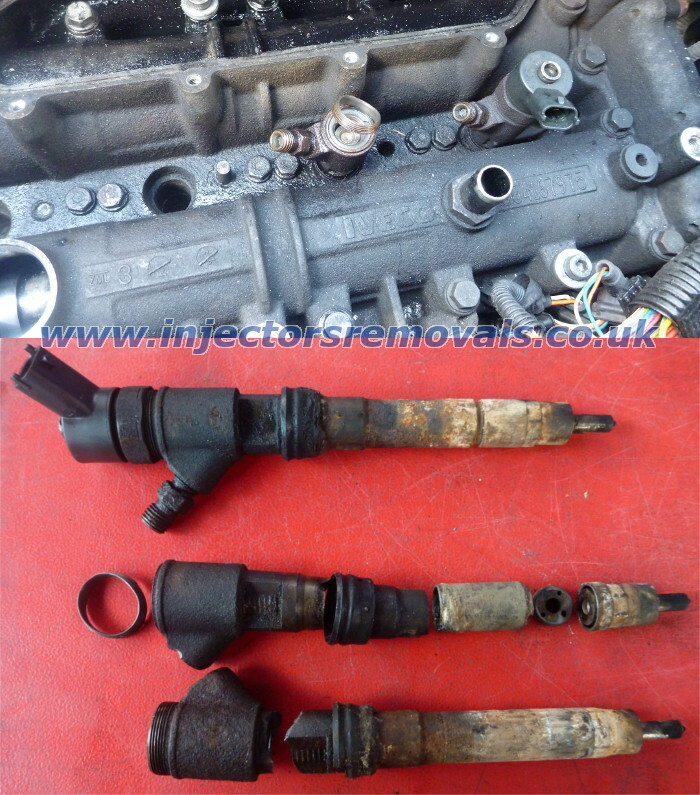 Some of broken injectors removed by us. 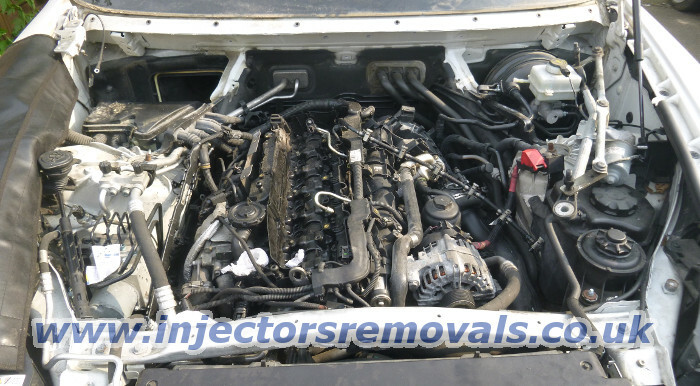 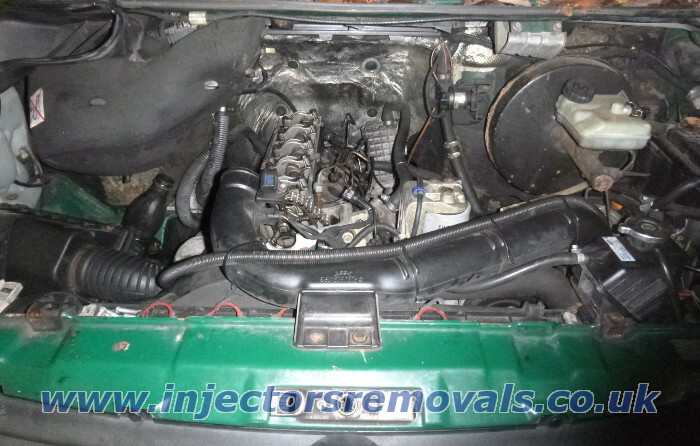 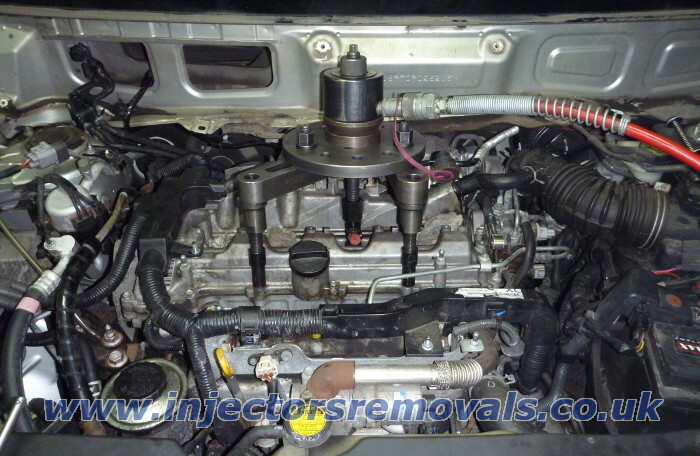 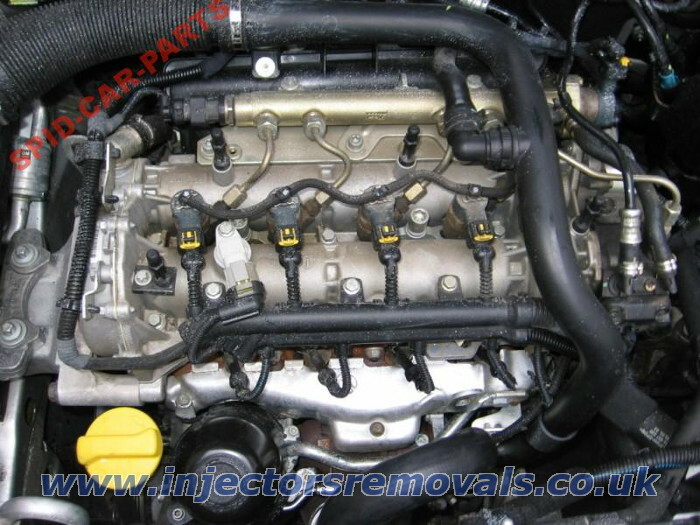 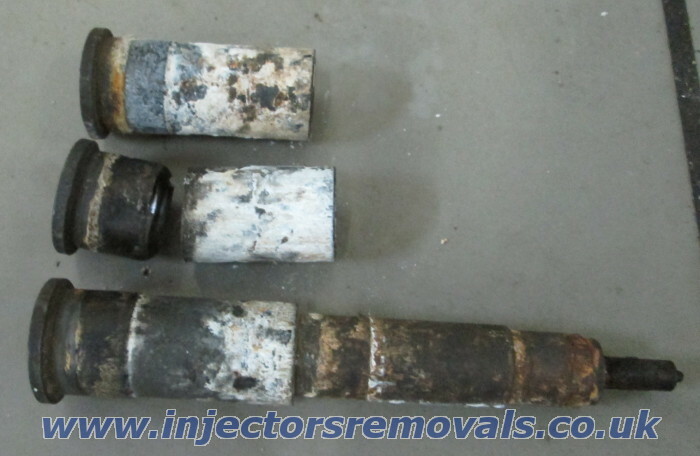 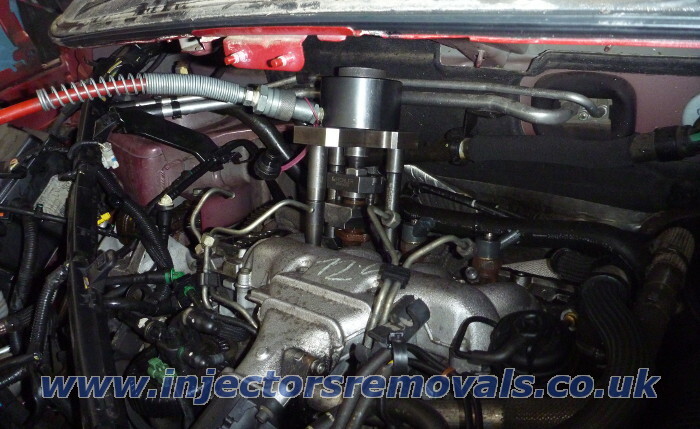 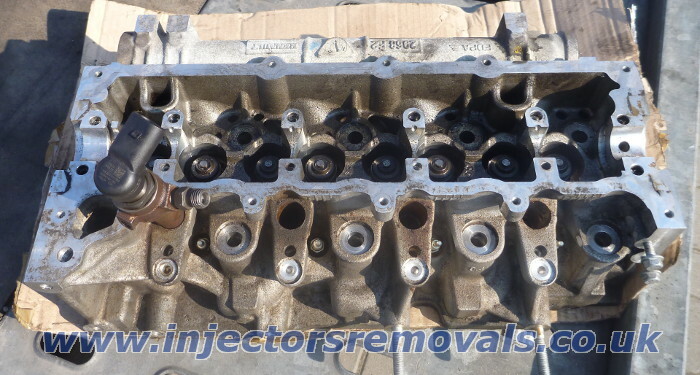 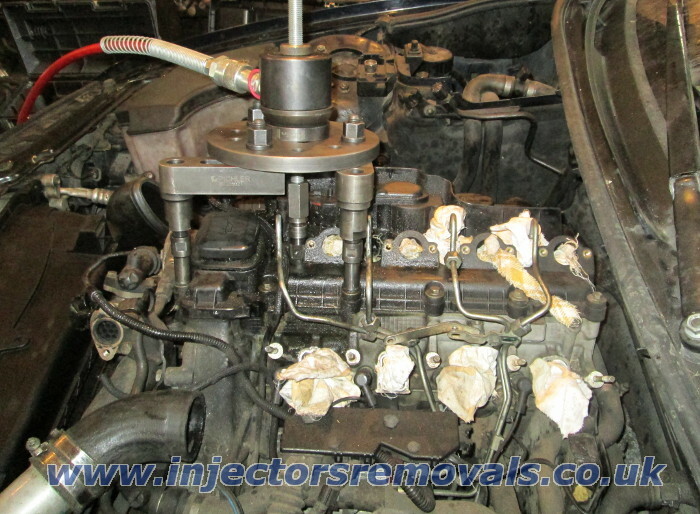 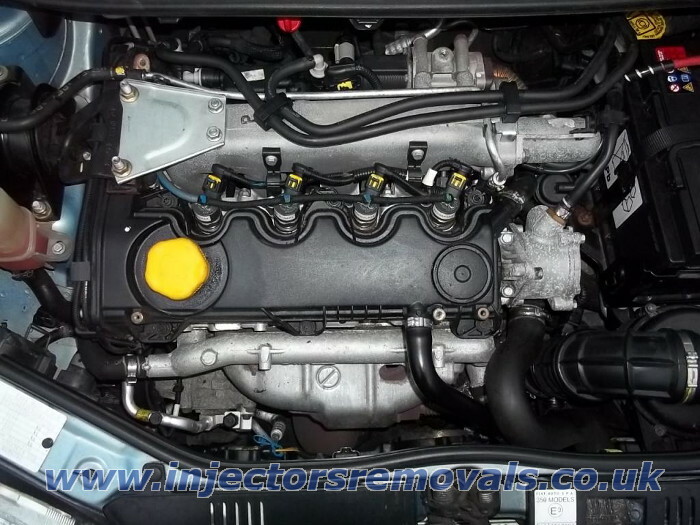 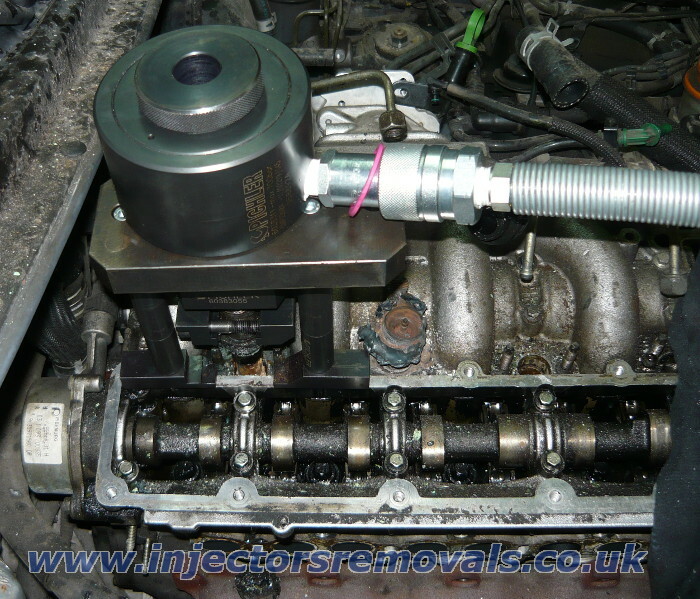 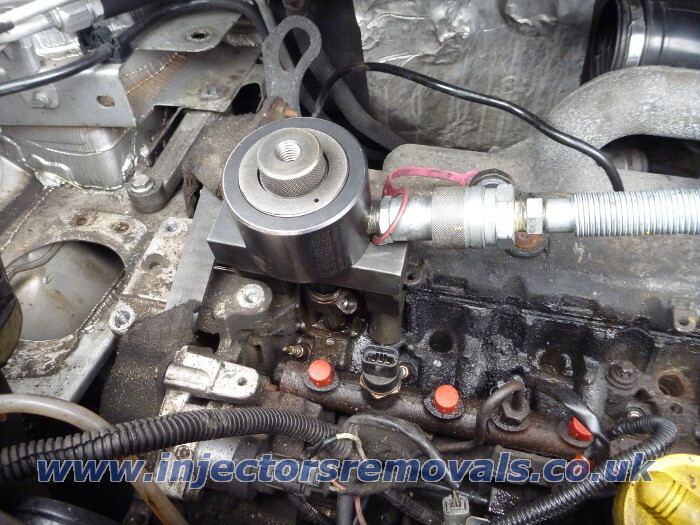 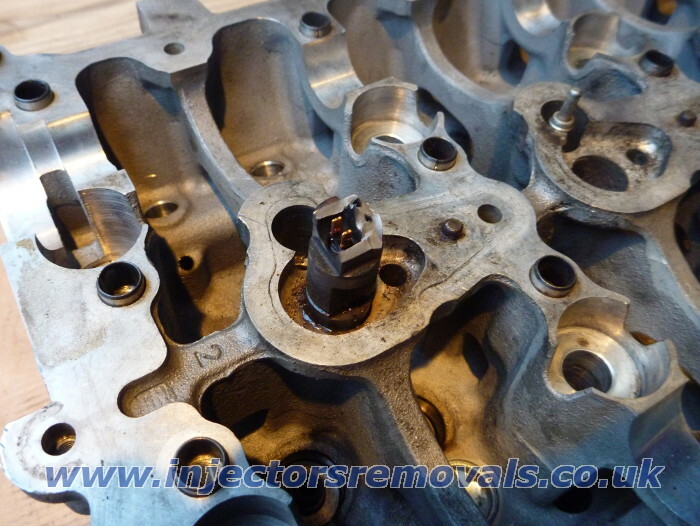 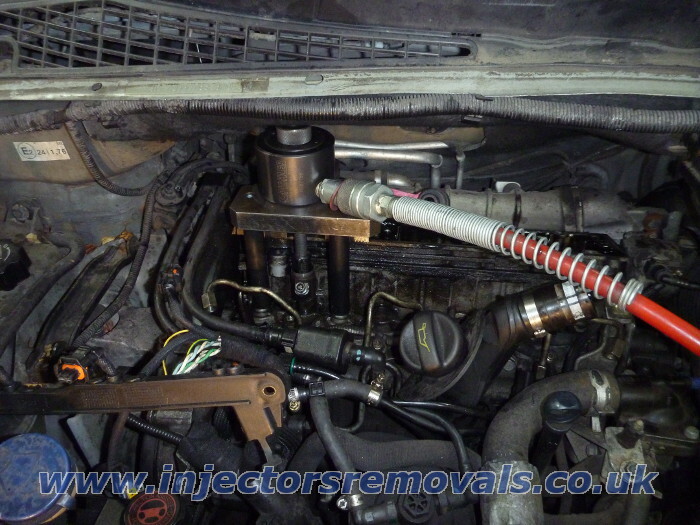 We have huge experience in injector removals. 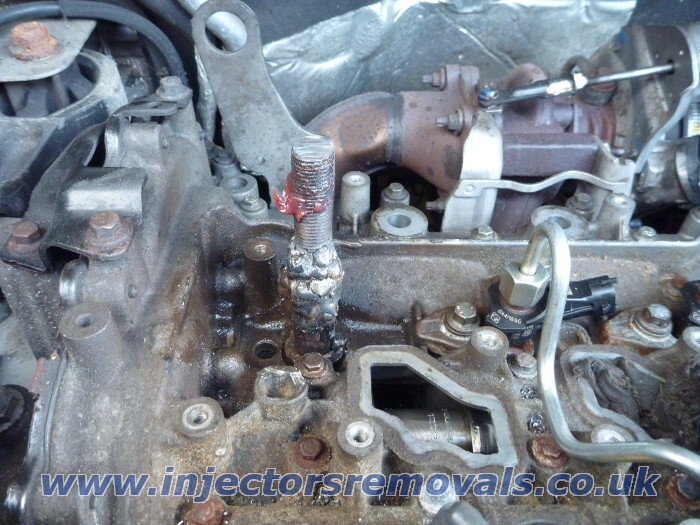 Injector removals efficiency approach 99%. 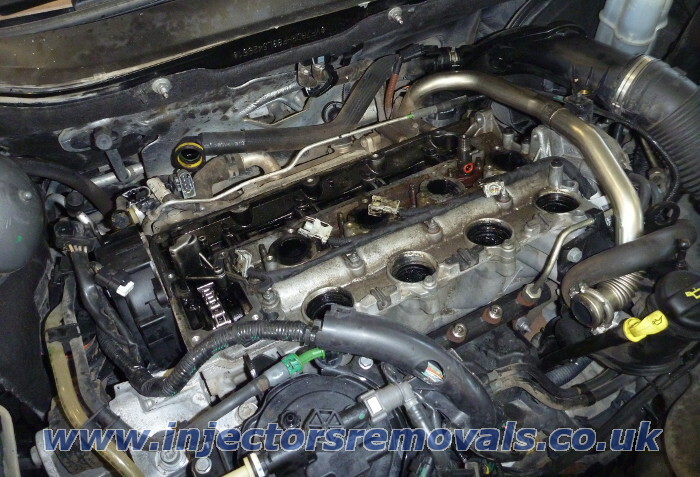 We diagnose Common Rail injection systems as well. 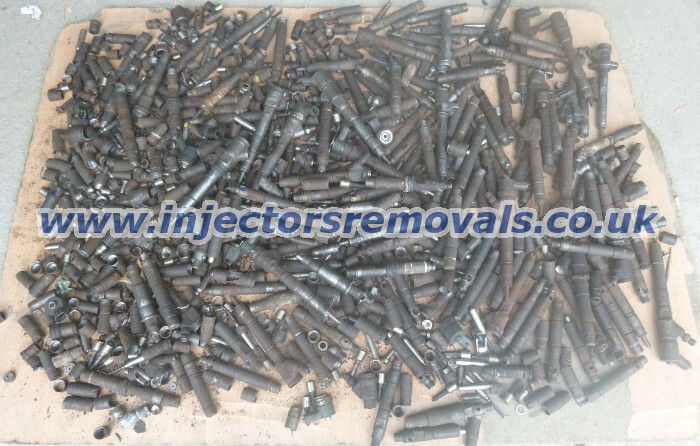 If u have any problem with any error code listed below call us. 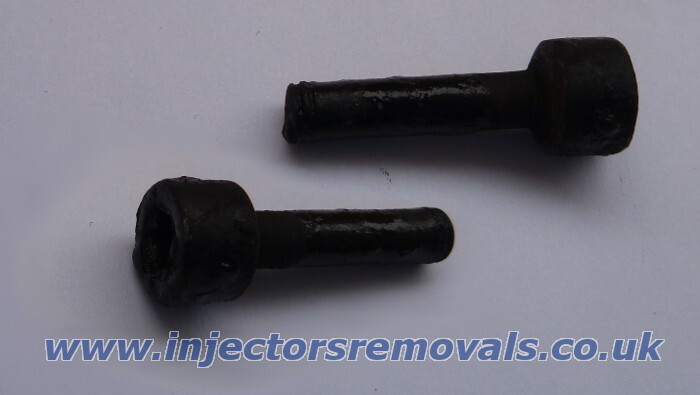 All brand marks belongs to their owners and were used to inform only.